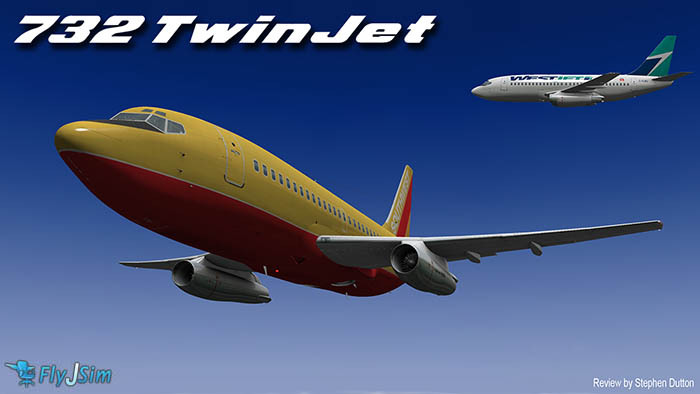 The Boeing 732 TwinJet is the third major release from FlyJSim after the Bombardier Dash-8 and the Boeing 727 Series. 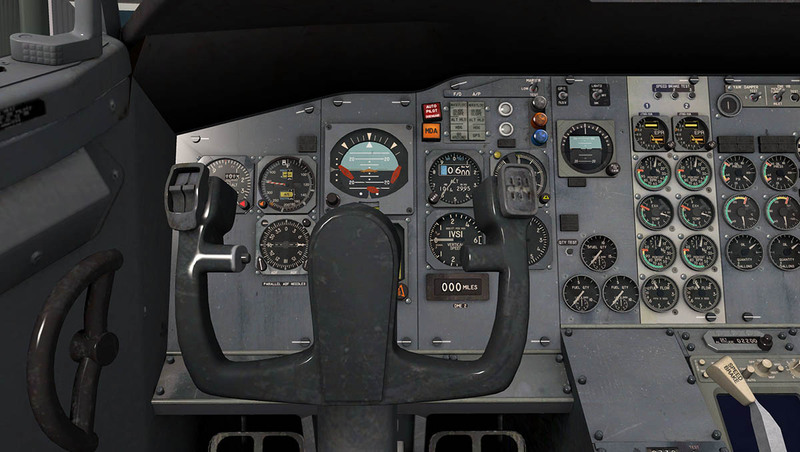 Without doubt the Boeing 727 Series was the aircraft of the year for X-Plane in 2013 (It was released just before Christmas 2012) and this Baby Boeing is in a very similar if not a perfect compliment to the bigger Tri-Jet. 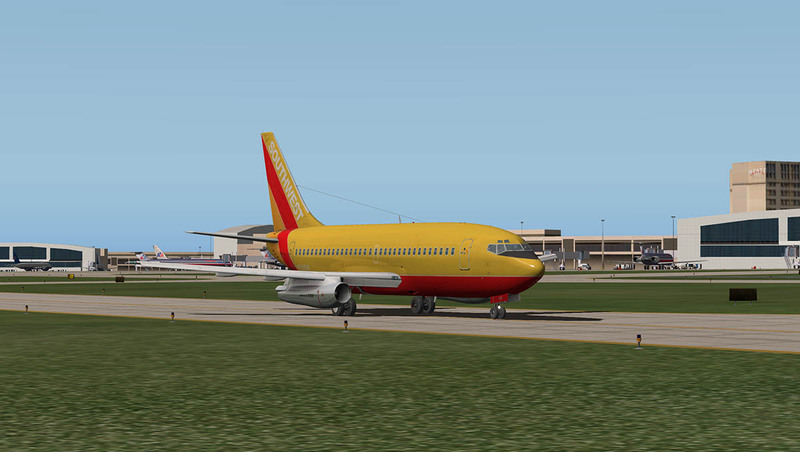 The 8000th Boeing 737 has just been delivered and that makes it the most built Jetliner in history, But this Boeing 737-200 known as the B732 is very different and from another totally different era than the common -800NG series that dominates our skies today. First thing to note is which Boeing 737 is which. The launch aircraft that was rolled out on January 17, 1967 was the -100 version of which only 30 737-100s were ordered and delivered. Then there was the -200 version rolled only months after the -100 version June 29, 1967, and entered service in 1968 of which was an extended fuselage version of the -100. 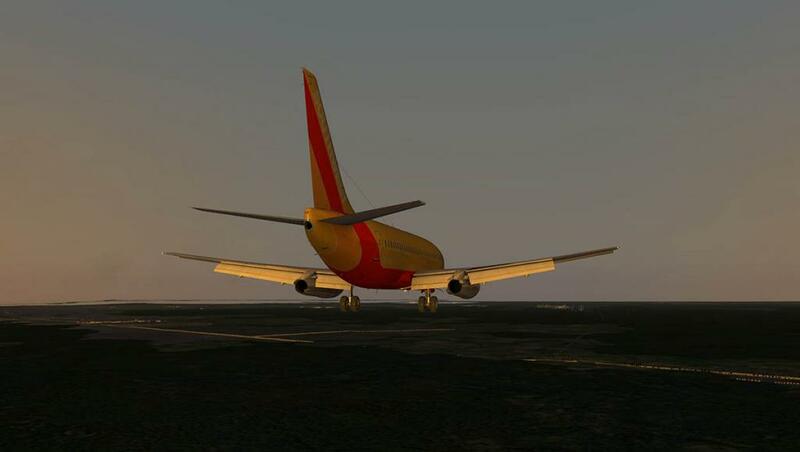 This aircraft and this aircraft released here by FlyJSim was successful at 991 sales (C-Cargo 104), but not straightaway as in fact In 1970, Boeing received only 37 orders and facing financial difficulties. Then after the cancellation of the Boeing Supersonic Transport and the scaling back of 747 production, enough funds were freed up to continue the project. Next was the Boeing 737 Classic -300/-400/-500 Series built between 1984 to 2000, 1,988 aircraft were delivered. 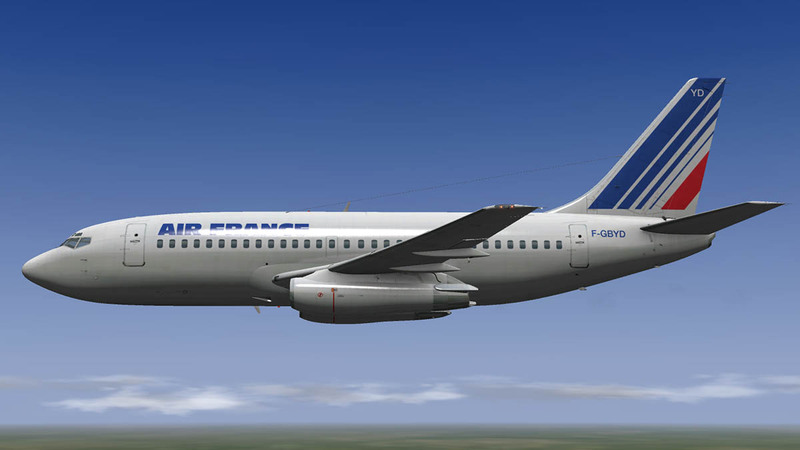 The next version was the Boeing 737 Next Generation −600/-700/-800/-900 Series, commonly abbreviated as Boeing 737NG. which brings us up to the present day. 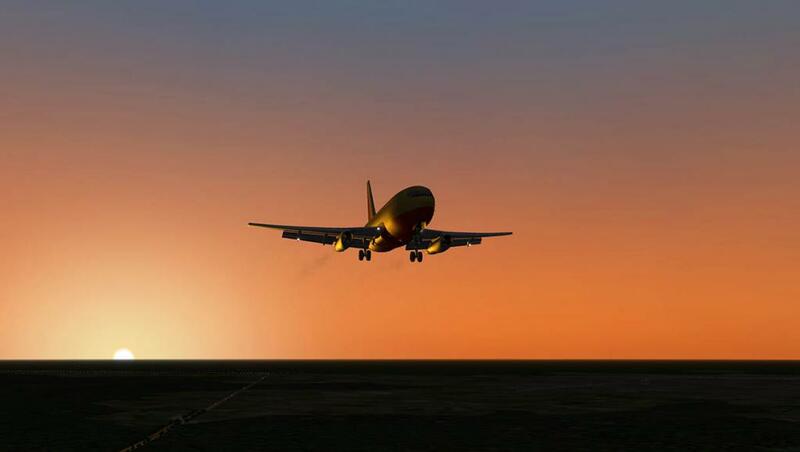 4,887 737NG aircraft have been delivered by the end of April 2014, with more than 6,700 ordered. 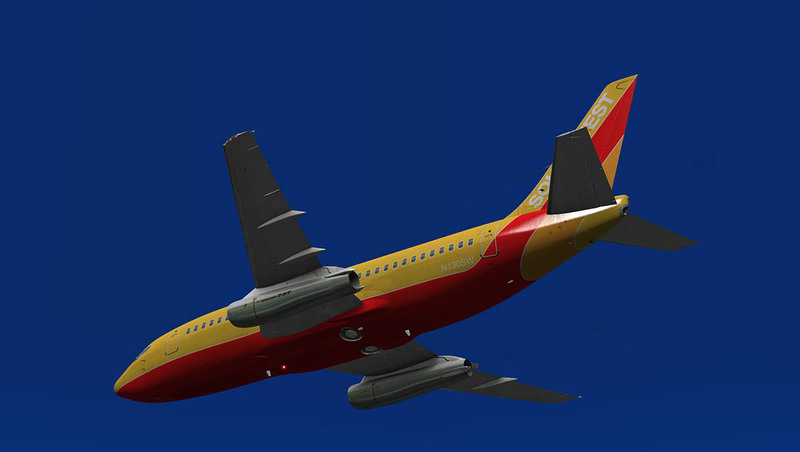 In the future is the coming 737MAX and that aircraft is scheduled for first delivery in 2017. 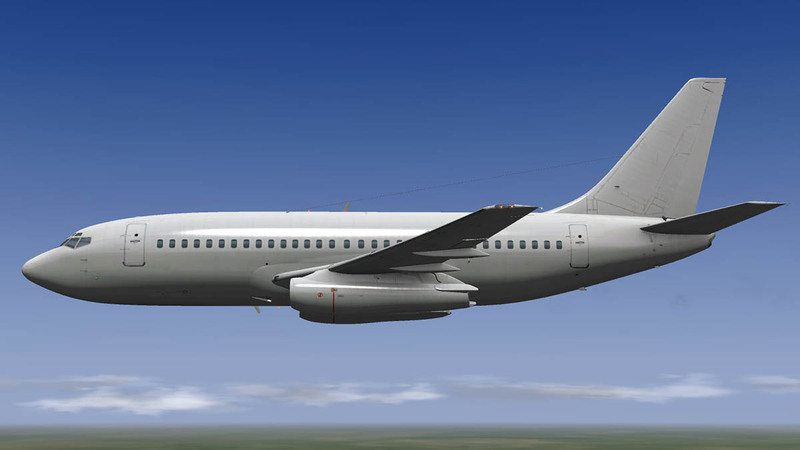 The Boeing 737 is a short- to medium-range twinjet narrow-body airliner. 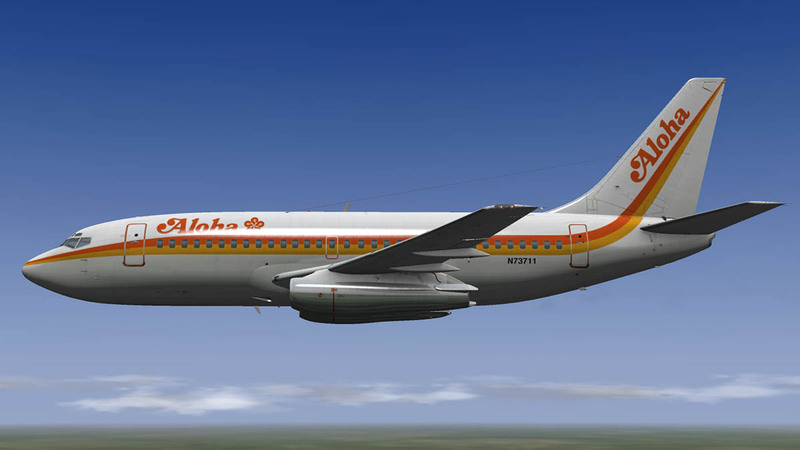 Originally developed as a shorter, lower-cost twin-engined airliner derived from Boeing's 707 and 727, the 737 it has developed into a family of nine passenger models with a capacity of 85 to 215 passengers. 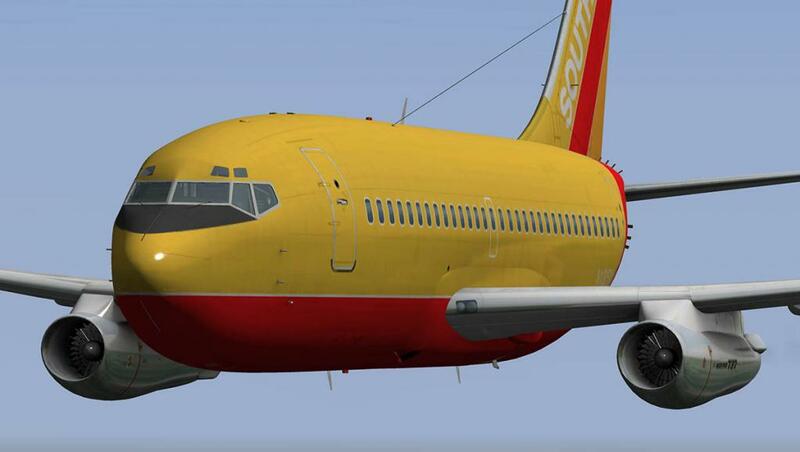 The 737 is Boeing's only narrow-body airliner now in production. 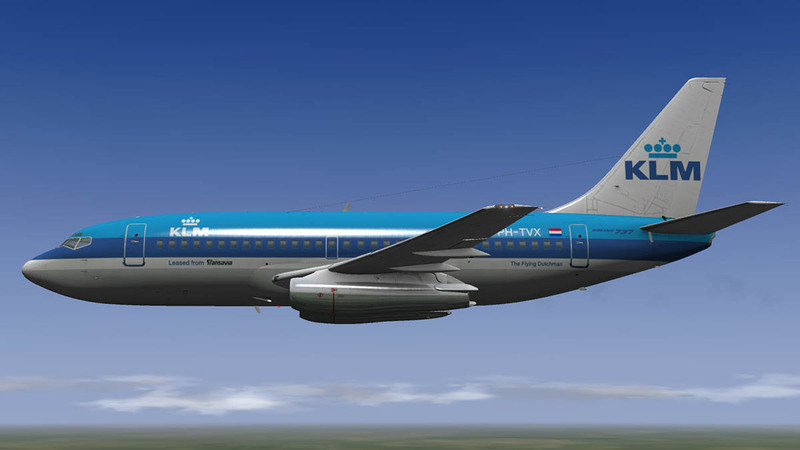 The -200 seats 136 (maximum) and 97 (2-class, typical) and is powered by the Pratt & Whitney JT8D 14,500–17,400 lbf (64–77 kN) low-bypass (0.96 to 1) turbofan engine that is also in the Boeing 727. Performance : Maximum speed Mach 0.82 (544 mph, 876 km/h) - Cruising speed Mach 0.74 (485 mph, 780 km/h) - Maximum range, fully loaded 1,900–2,300 nmi (3,500–4,300 km; 2,200–2,600 mi) - Service Ceiling 35,000 ft (10,700 m) Weights: 69,800 lb (31,700 kg) empty : 128,100 lb (58,100 kg) Takeoff. This review has to be considered in if the user has flown the FlyJSim Boeing 727 series or not. 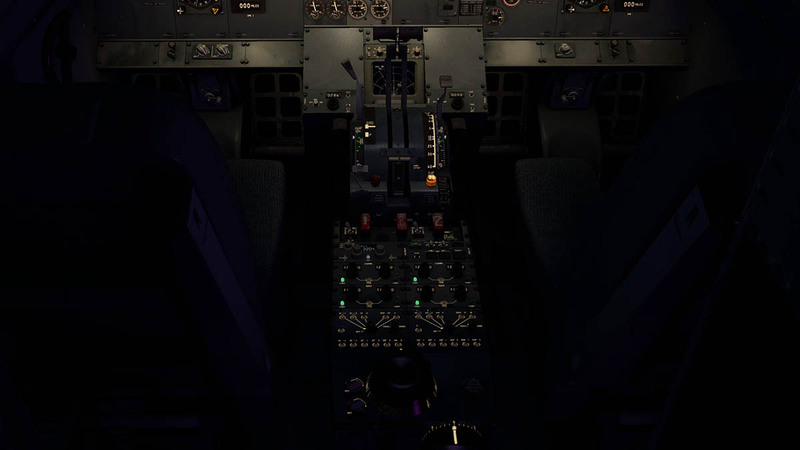 If you have then the conversion to the B732 is quite straight forward and although the cockpits are arranged quite differently (The B727 has a third flight crew member in a Flight Engineer) the systems are organised and used is a similar way but for two engines on the B732 and not the three on the B727. 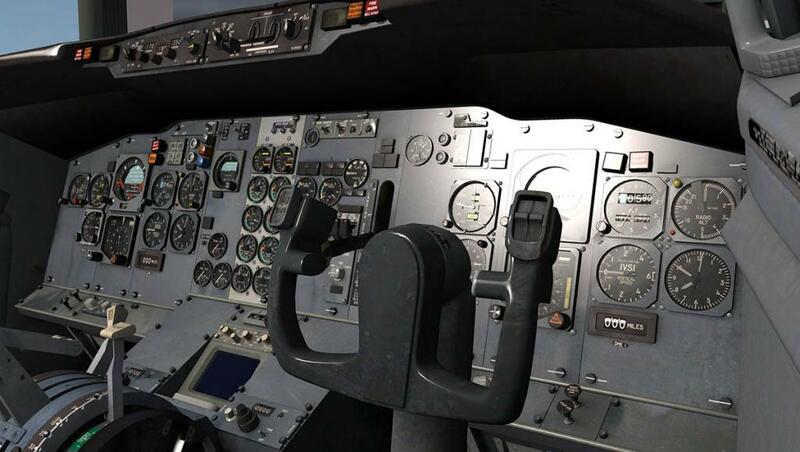 If you are new to the FlyJSim Boeing aircraft then there is a bit of a learning curve to understand the various systems and procedures. The aircraft handle very differently as well, in mostly their age and the era that they flew in... There are no mod-cons on offer here. 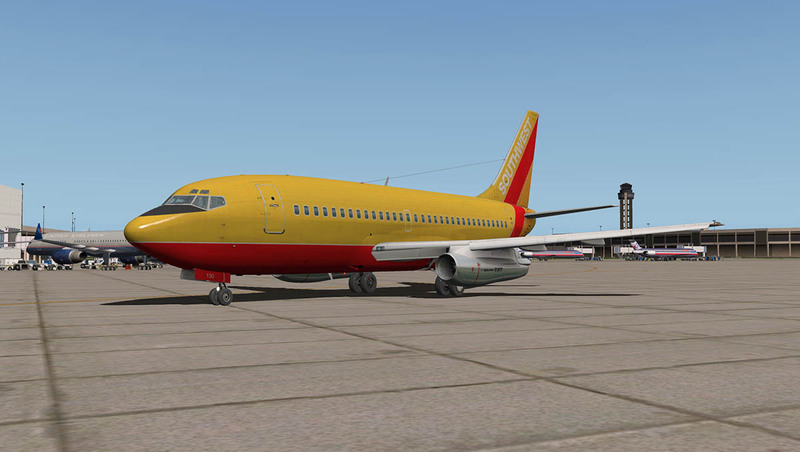 However like with our Aircraft Profile : Boeing 727 Series by FlyJSim (Part Two) "Flying the Boeing 727" we found a certain and if not more fulfilling and simplistic way to fly these aircraft and the B732 here is no exception. 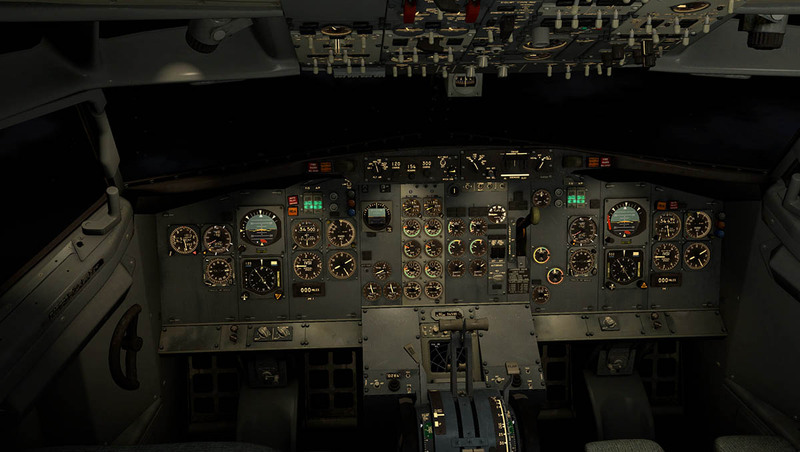 Looking into the cockpit of a cold (unpowered) B732 aircraft and the difference of the era compared to today's glass cockpit driven aircraft is quite a shock. How could you believe that these aircraft could and did transport millions of passengers with such naked little instrumentation, mostly from the navigation perspective. They did and they did the work very well and even today there are some aircraft still flying around up there still doing so. There are some great detailed cockpits in X-Plane today, but in both the B727 and here in the B732 the design is simply brilliant. Big clunky switchgear and almost to the touch flick switches, you are in cockpit heaven. 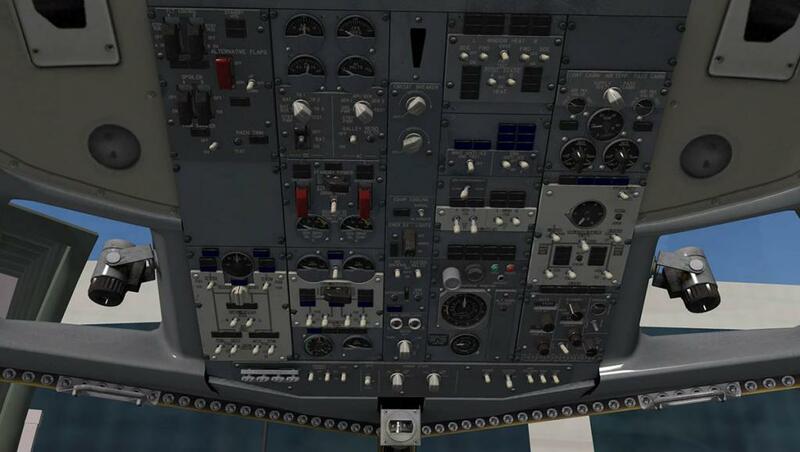 The cockpit panel is all dials and gauges (sometimes known as clockwork cockpits) and the detail is simply overwhelming. You really do get the feel of the sixties style cockpit in perfect perspective. The chunky (and quite worn) Pilot and Co-Pilot yokes do take up a lot of the panel view, removed you can now see the instrumentation clearer. 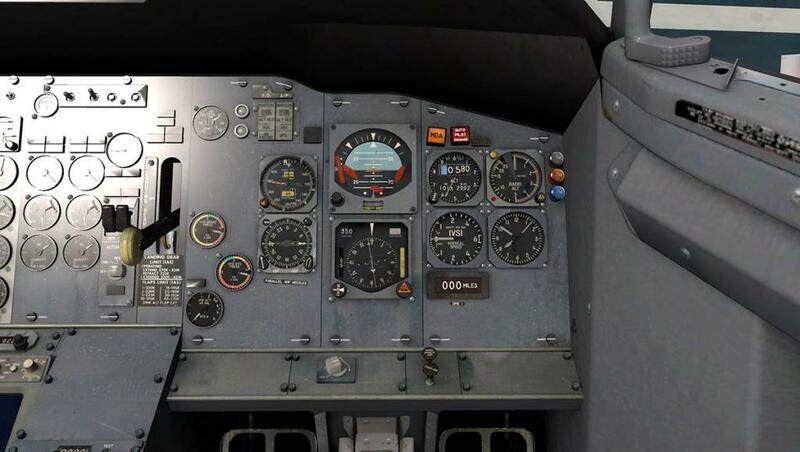 The standard six aircraft instruments are as they should be are front and centre. Very clear and easily readable. 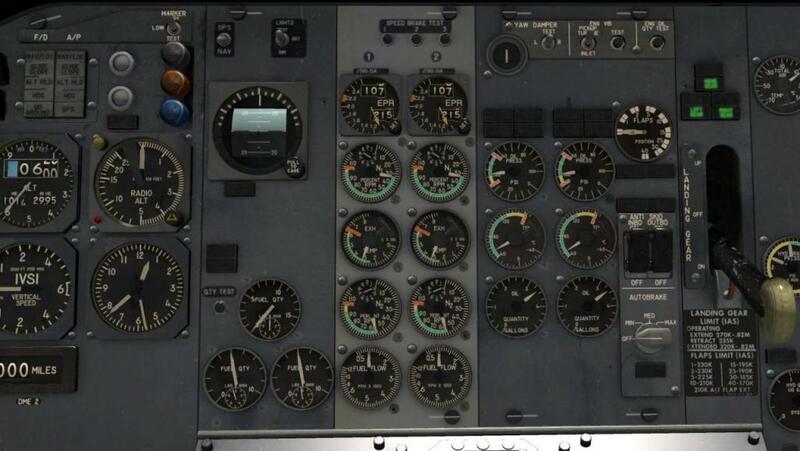 The Standard Six are - Artificial Horizon (sometimes known as the attitude indicator) with built in turn indicator, Heading with built in OBI, Compass, Vertical- Descent Speed, Altimeter and Speed (in knots and Mach speed). 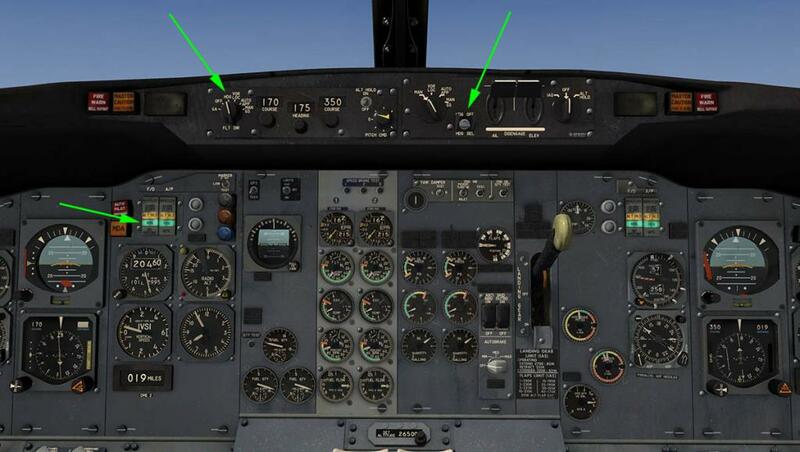 Then there are the back up instruments of Artificial Horizon, Altitude (spare), Radio Altitude, Clock (large) and the DME 2 - NAV 2 (distance) is also situated lower down. 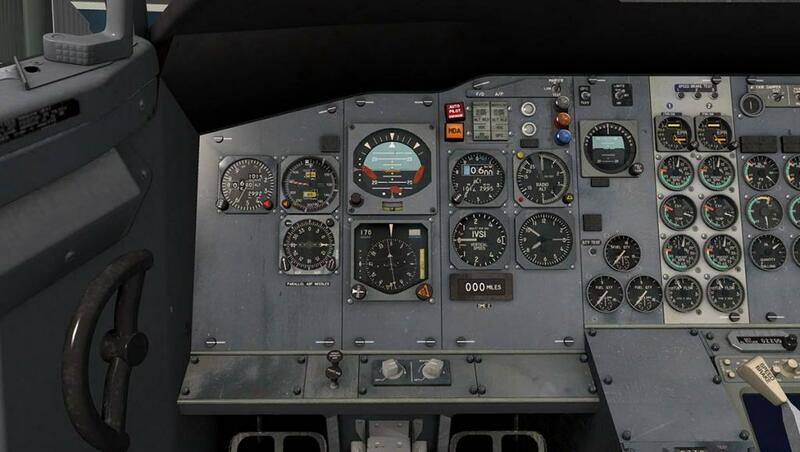 The compass allows for the VOR and NDB to be switched on two separate pointer needles, VOR 2 on the pilot's side and VOR1 on the Co-Pilot's side. 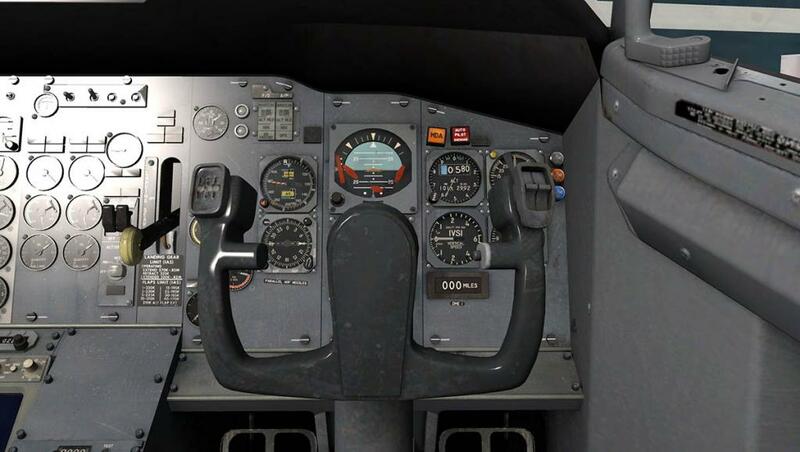 The Co-Pilots set of instruments are very similar except they have the (outside) air-temperature, hydraulic Sys, Oil and Brake temperatures and the DME 1 - NAV 1 (distance) indicator. 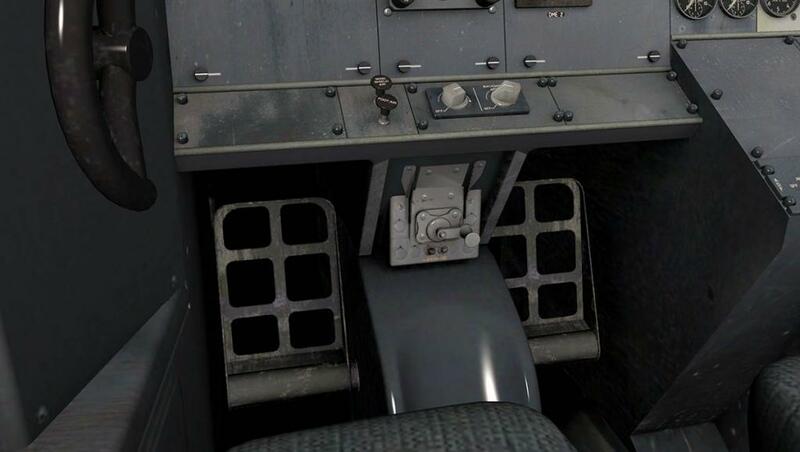 The landing gear lever is also on the right side of the panel. Centre stage of the panel are the main engine instrument sets of two engine dials covering "Engine Pressure Ratio" (EPR), N1, EXH (Exhaust) Temp, N2 (Percent RPM) and Fuel flow to each engine. 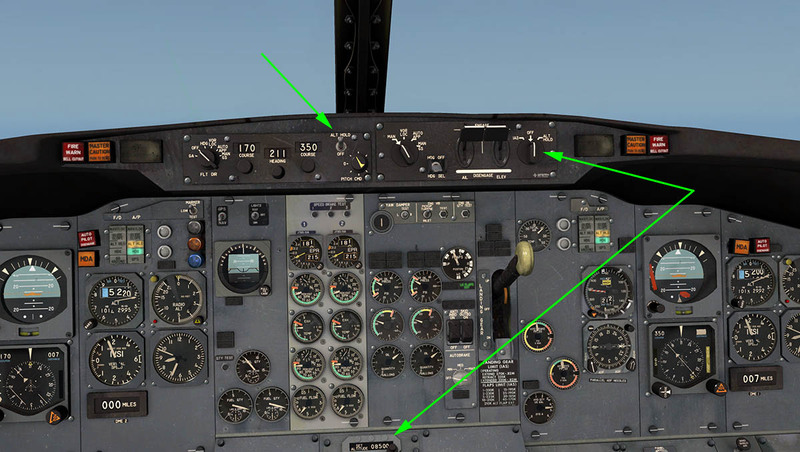 Left of the main engine dials are the three fuel tank gauges, and to the right the twin Engine Oil - Pressure, Temp and tank quantity. Finally the Auto-brake selection switch is here as well. 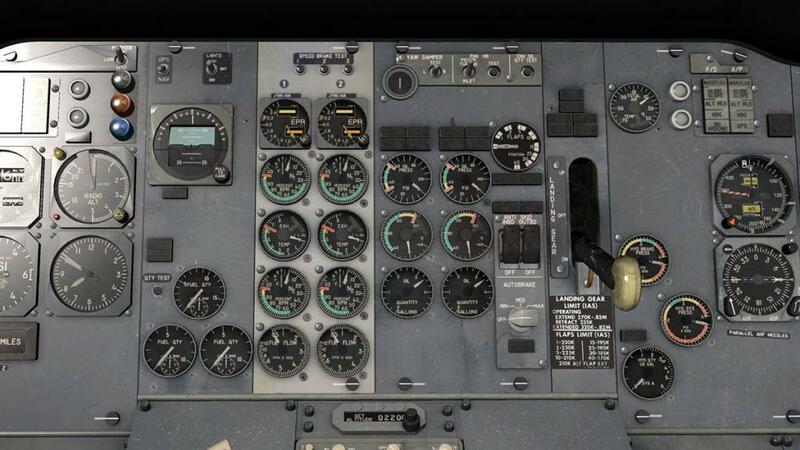 If you know the B727 panel you would feel right at home here as the differences are quite small, just twin dials instead of the three on the larger jet. 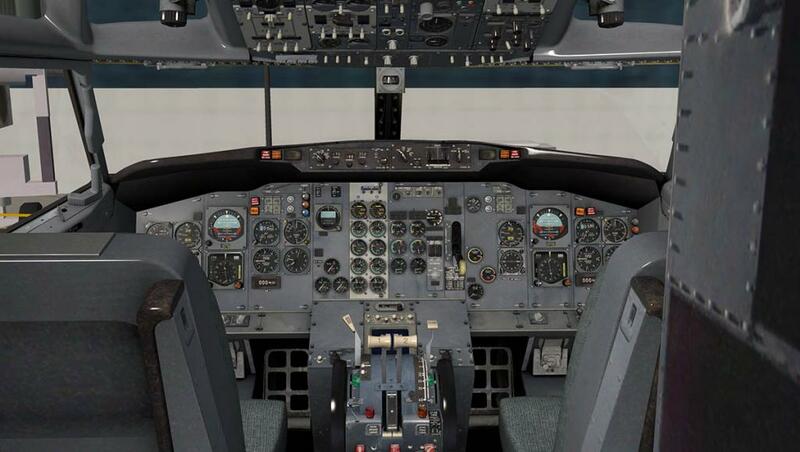 The biggest difference of a few years of development between the Boeing 727 and the Boeing 737 is the "Sperry SP-77 (option version)" auto-pilot (A/P). 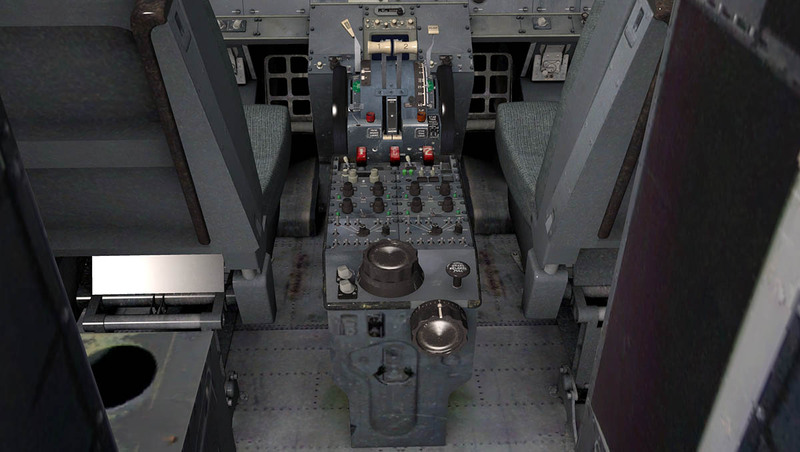 In the B727 it was a very simplistic system set behind the pedestal. But here it is more of a modern version set out on the glareshield. 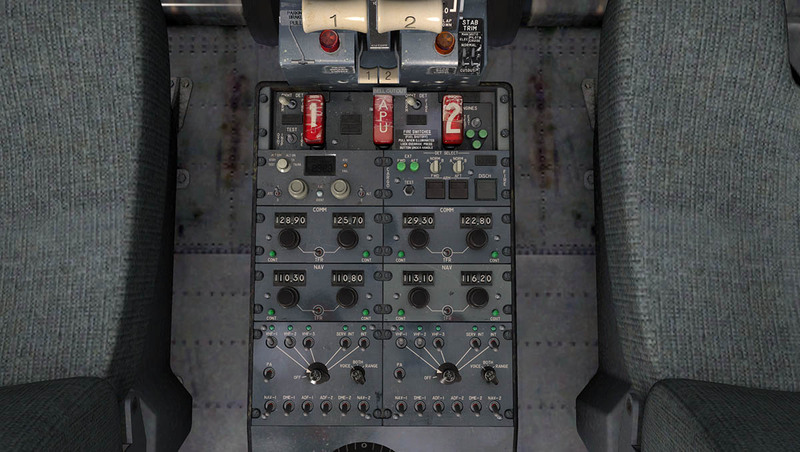 Not quite the standard layout version we know today, as that A/P version was fitted to the later B737-200ADV. It is split between the F/D (Flight Director) on the left and the A/P (Auto Pilot) on the right. Still simplistic in nature, it was and is very powerful in operation as we will see in flight. Besides the change of position of the A/P to the glareshield. 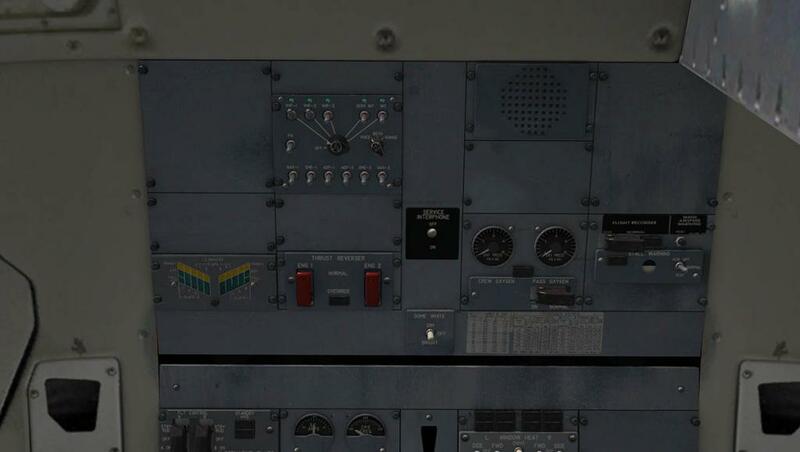 The removal of the Flight Engineer's station on the B727 also moved the aircraft's systems and operations to the now more familiar place on the overhead panel (OHP). 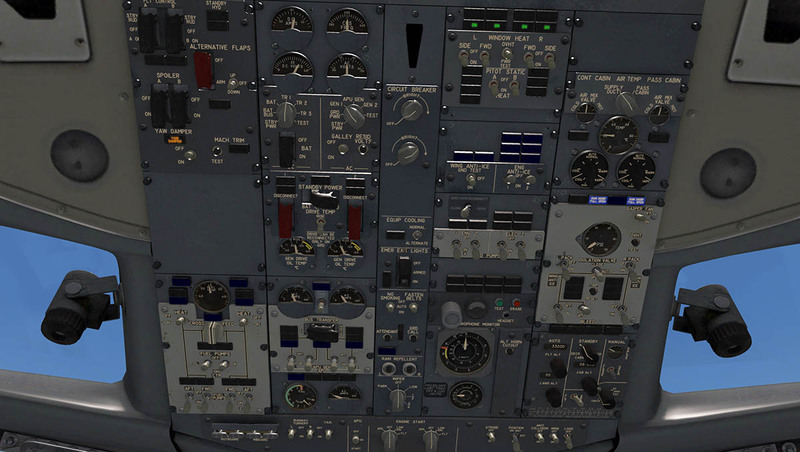 looking over the panel quickly it hasn't really changed much since either on the subsequent B737's versions, and yet it would be very familiar to you as well as it was laid out on the B727 engineers station. Only now a few items have been made automated. They are however still grouped together in their various areas of systems (mostly in long tall sections) in hydraulics, boost fuel pump switches, electrical, APU, air-conditioning, de-ice, bleed and all the various lighting switches. The engine start is now the familiar GND-OFF-LOW IGN -FLT switches. The pedestal is almost identical to the B727 version except it is now for two engines and not three. In craftsman like work the pedestal can not really be bettered. It is sublime in detail and so real in operation you can't really believe it is only a computer generated image. 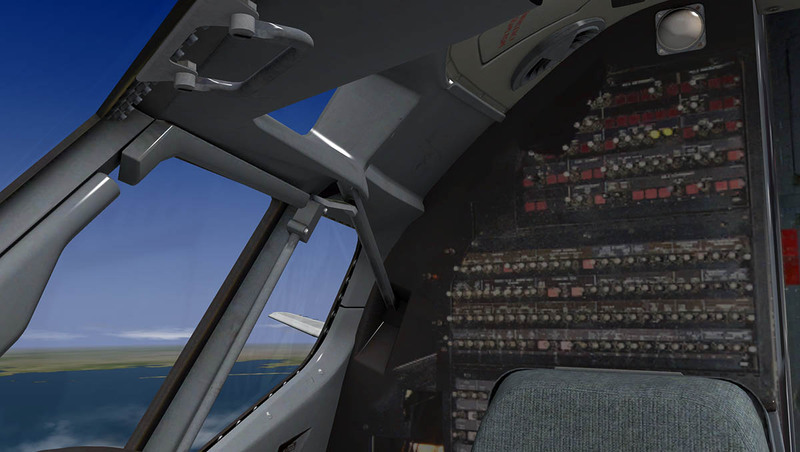 in the cockpits 3d world it is realistic in every form. 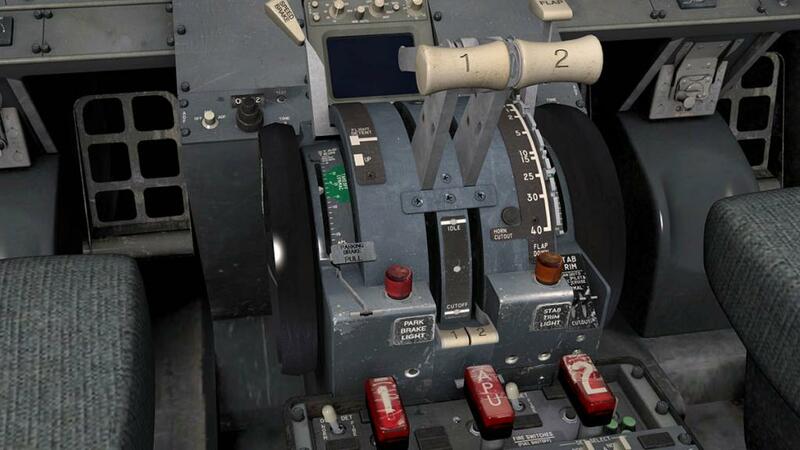 Besides the beautifully crafted throttle levers there is the speed-brakes (with auto), park brake, engine fuel flow idle/cutoff's levers, stab trim (electric) and flap indicators for the outbound and Inbound flaps (0º, 2º, 5º, 15º, 20º, 25º, 30º and 40º settings). 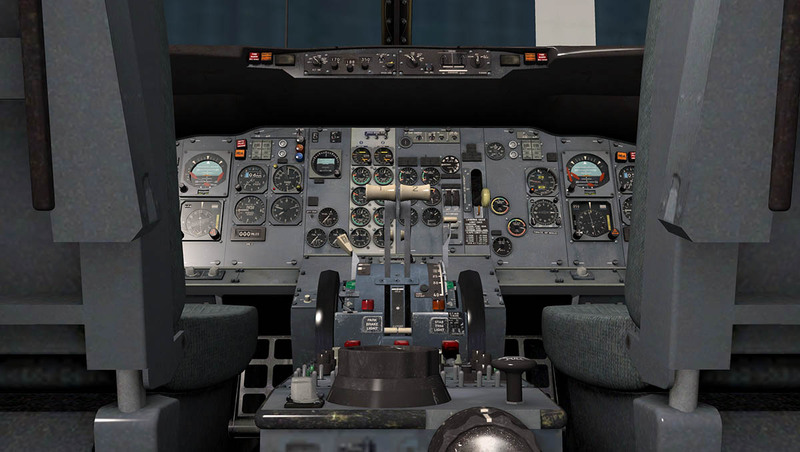 The radio is set out behind the pedestal below the three red fire handles (two for engines and one for the APU) and is very easy in operation. Just set you frequencies and flick a switch to make one or the other active... how easy can that be. Comm's and (early digital!) transponder are set out here as well. Above the pedestal is an early weather radar that just shows the standard X-Plane weather images. Detailing on the rudder pedal's is to be admired. 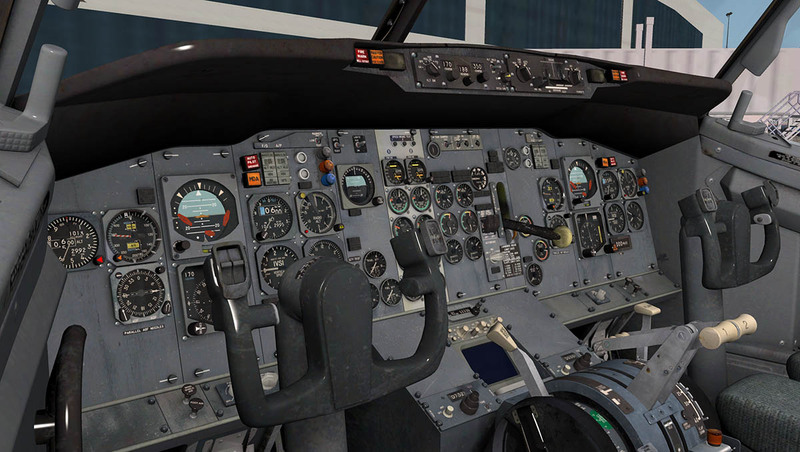 Like everything else here in the B732 cockpit they are extremely well crafted and designed. Missing from the radio panel however are the ADF knobs... they are both (one each side) situated high up besides the throttle part of the pedestal, and have a three way setting that is excellent and very easy to tune. Nothing is more exciting than bringing a machine to life. 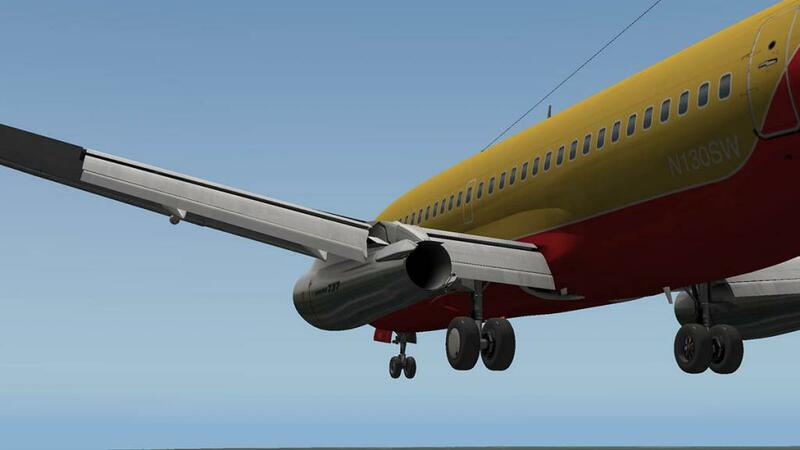 Certainly with a flying machine, and the B732 is no exception. 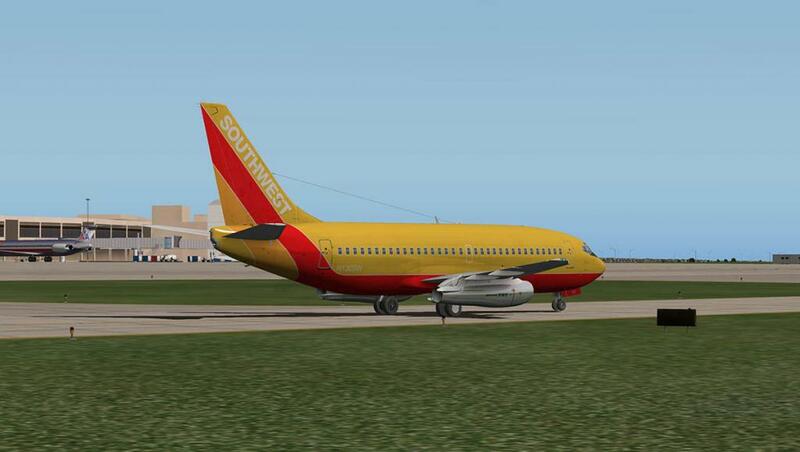 But first we have to set up the aircraft. There are four menu options on the middle-lower left of your screen - V/Card - WnB (Weights and Balances) - OP (Options) and INS. We will start with the "Weights and Balances" menu (manager). Here you can set all the aircraft's weights and fuel and passenger/cargo loads. 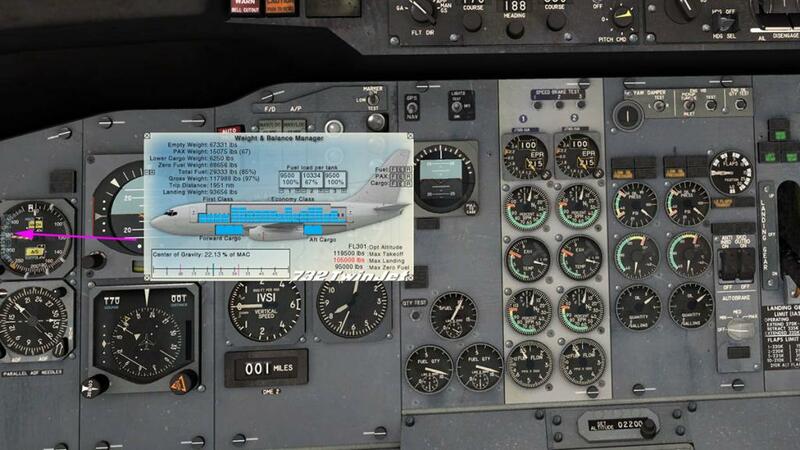 And as you do so the system will calculate for you the correct number relating to the aircraft's status and also show you your CofG (Centre of Gravity). The important number is your "Max landing" number shown in red. Here I have made the aircraft quite heavy at 117988lbs but I have a fair distance to go so I will certainly be under the landing weight. Cleverly if you open the Vref menu (or V/Card) the Vref's are calculated for you correctly and so are the landing vRef's, note that if you change the flap degree the vRef will change as well to compensate... a more clever idea again. Another note is that the landing speed is incorrect at this point because the aircraft's weight is wrong, this will change as you burn off the fuel or the weight. The other Menu item is the "Options" card. 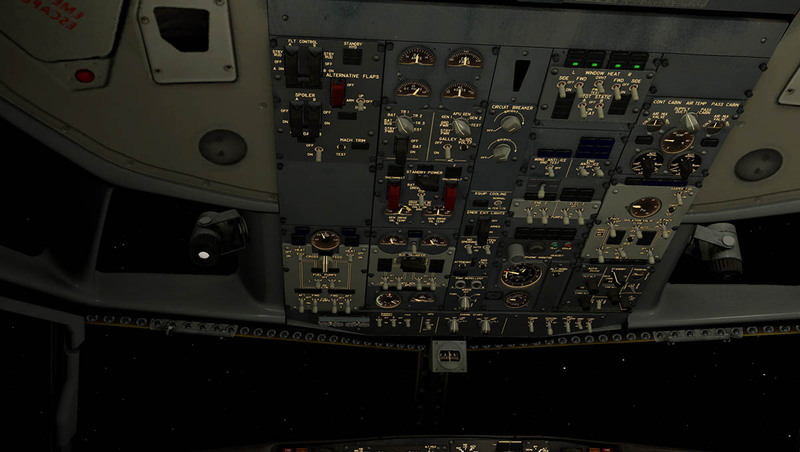 Here you can set all your options in: Cold and Dark startup or Engines running (hot) and set the time to Zulu. Hide the yokes and set weights to Kg's and finally select if required the Ground Power and Air Cart (to start the engines). Views and sound adjustments can also be adjusted. Weights and fuel set we can now power up the aircraft. Battery on via the "battery switch", You know that this does give the aircraft power but not for very long. You do have the Ground Power and Air Cart in the options menu to use. I found that in many instances they don't work? or connect up to the aircraft, which is slightly annoying. 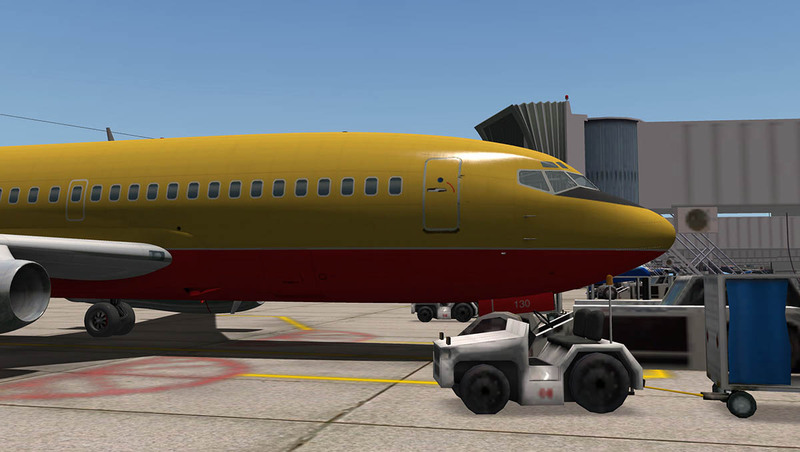 You don't get a power cart or air cart either outside the aircraft which are now usually de rigueur with aircraft of this price category. 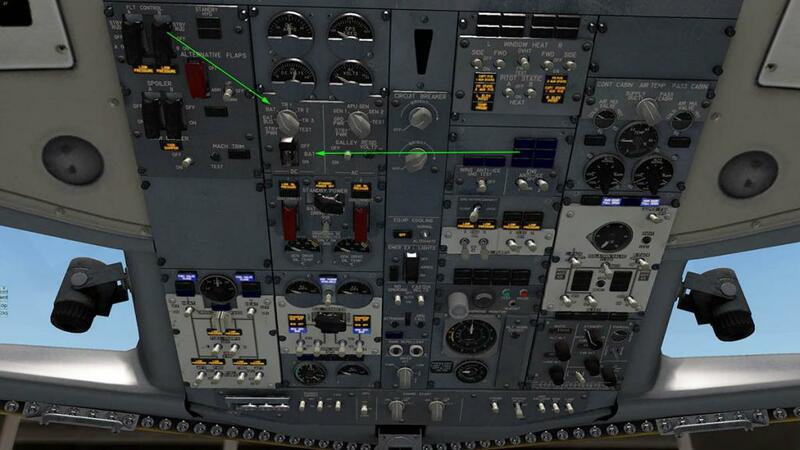 Here at KDFW it does connect and you can connect up the power via the switch and turn the AC switch to GND/PWR. Another option is the APU (Auxiliary Power Unit), start it up via the switch and wait, the unit takes it time to warm up... and then switch it over to APU/GEN on the A/C bus. Now ready to start the engines we can switch on the fuel pumps and hydraulics and the outside anti-collision beacons. The panel is "if it is lit, it is not active" so as you do the start up the OHP should clear until all the lights go out. Here FlyJSim has done a brilliant amount of work to make the panel so authentic, in most cases we take it for granted by using it all the time. But this is great work in that how you interact with the panel now is so real. 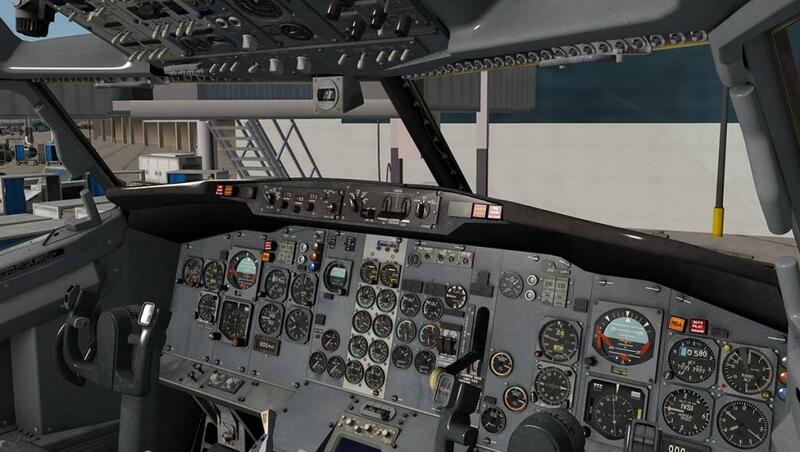 APU to bleed and make sure the L & R Packs (air-con) are off and you are ready to turn on the engine switches to GND (start) if you are flying you then re-start via the FLT (start). As the engines power up then add in the fuel via the levers on the pedestal, and the rest of the engine start up is automatic. The engine gauges in the centre panel will spiral and note the conditions of the engine to the idle position. 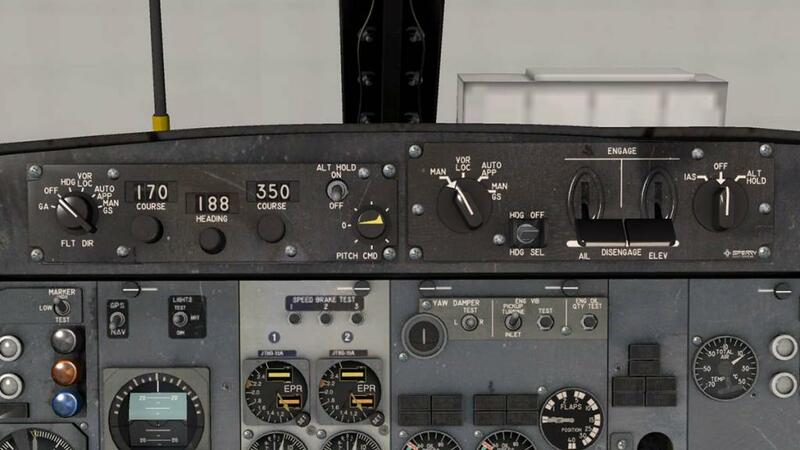 then all you have to do now is clean up the OHP with turning on the aircraft electrics (buses), pitot heaters and when running at idle turn off the APU bleed and the (air-con) packs on. As they say "A clean panel is a good panel" and you are good to go. You can purchase the Delco Carousel IV-A Inertial Navigation System. Nicknamed "CIVA", CIVA Navigation System for $US10.00 that is a basic navigation system that can give automatic navigation of up to 9 waypoints. 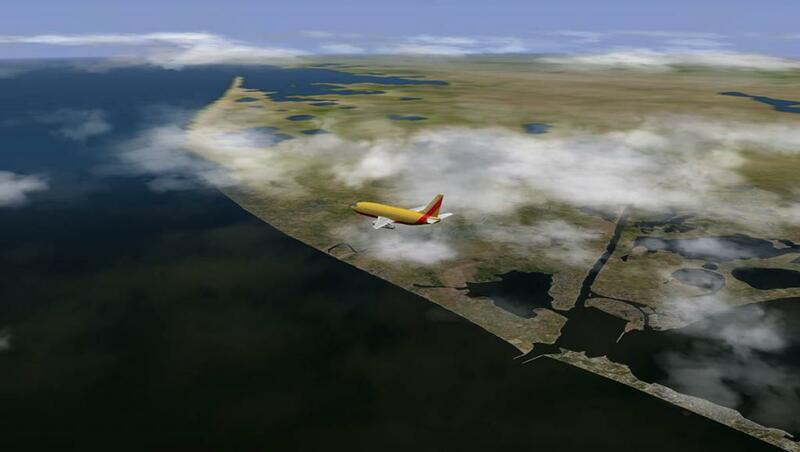 (you can load X-Plane .fms plans) and it can be used in the FlyJSim B727 as well as other aircraft of that era. Well worth the addition cost. The JT8D's are whining now outside, sounds are excellent and 3d in rotation of the aircraft and has the "Realistic Sound" engine provided by DreamEngine & Turbine Sound Studio sounds. These early engines are noisy and smoky, but you certainly miss today the futuristic missile look of those long engine pods, beautifully done here... they just were not what the future turned out to be. 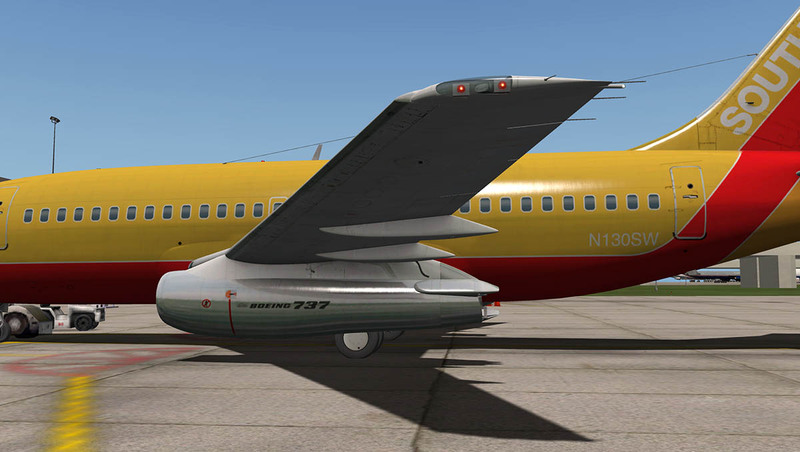 The original engine nacelles incorporated thrust reversers taken from the 727 outboard nacelles. Unfortunately they proved to be relatively ineffective and apparently tended to lift the aircraft up off the runway when deployed. This reduced the downforce on the main wheels thereby reducing the effectiveness of the wheel brakes. 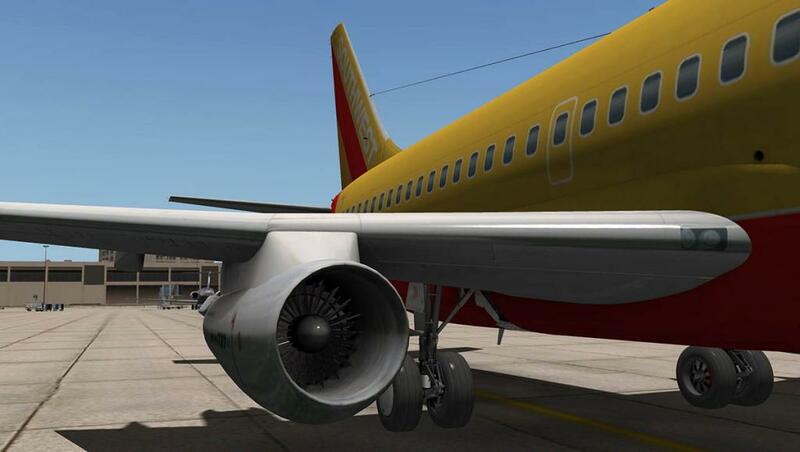 In 1968, an improvement to the thrust reversal system was introduced. 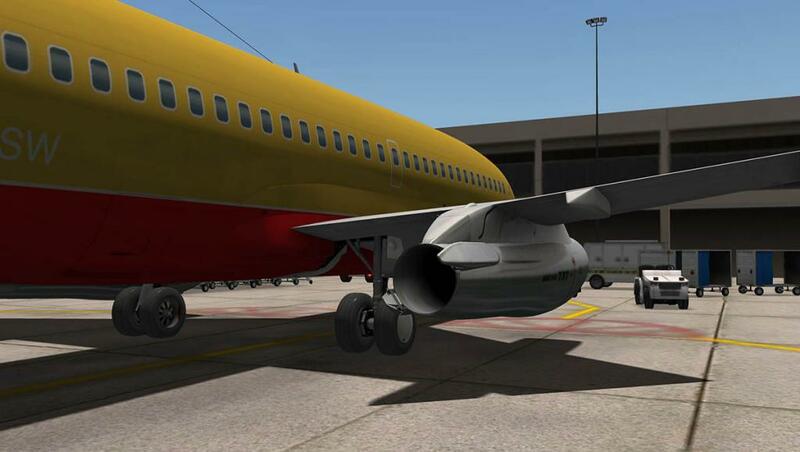 A 48-inch tailpipe extension was added and new, target-style, thrust reversers were incorporated. 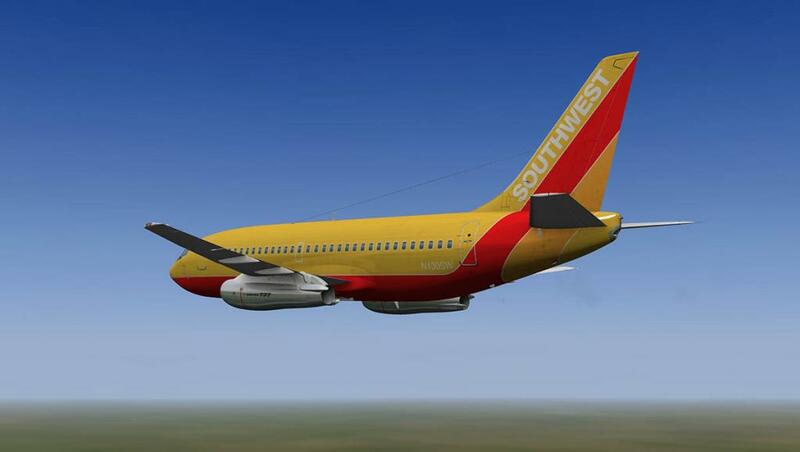 The thrust reverser doors were set 35 degrees away from the vertical to allow the exhaust to be deflected inboard and over the wings and outboard and under the wings. [ The improvement became standard on all aircraft after March 1969, and a retrofit was provided for active aircraft. 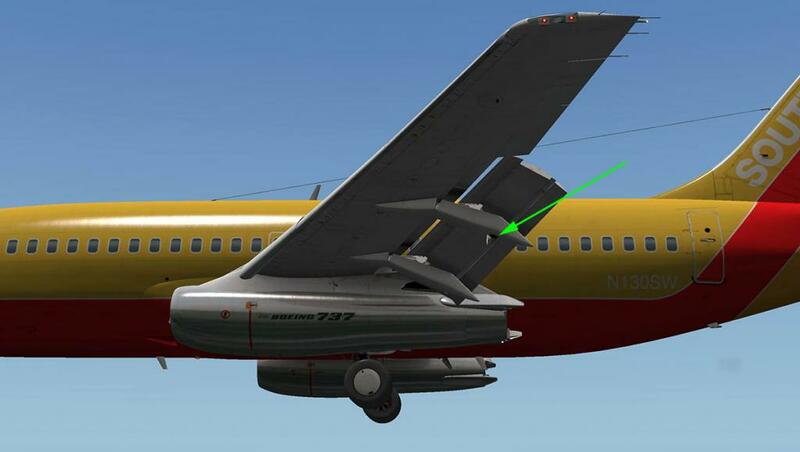 This accounts for the odd angle of the thrust reverser doors and the very long tail pipe, but the main reason was that in thrust reversal deployment the original B727 version would actually lift the aircraft off the runway on landing! The undercarriage is excellent as well, great linkages, legs, tyres and animation. the engines hide most of the work, but it is worth checking out. 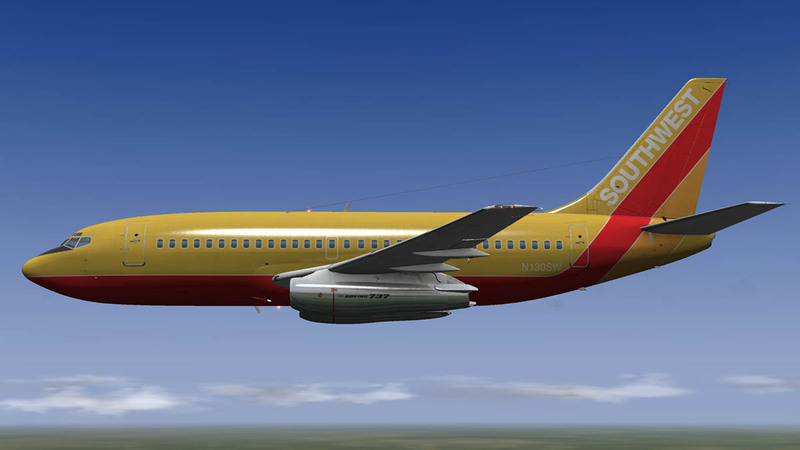 The wings are very similar to the B727 in forward leading edge slats (inner and outer) and the seven position trailing edge flaps. wing and flap detailing is overwhelming and work to be admired, certainly in the powering out of those flap extensions. 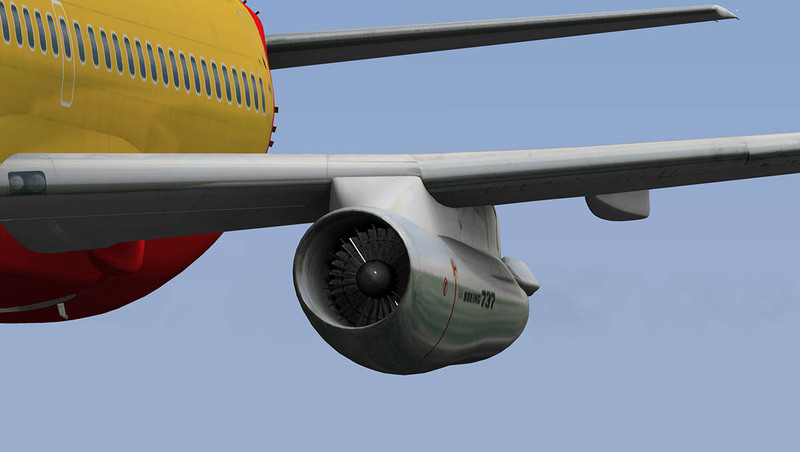 The landing light pops out under the wing(s) as well on the flap runners, the lower the flap position then the lower and change of angle of the landing light... great detailing. On the options menu you have a pushback built in. 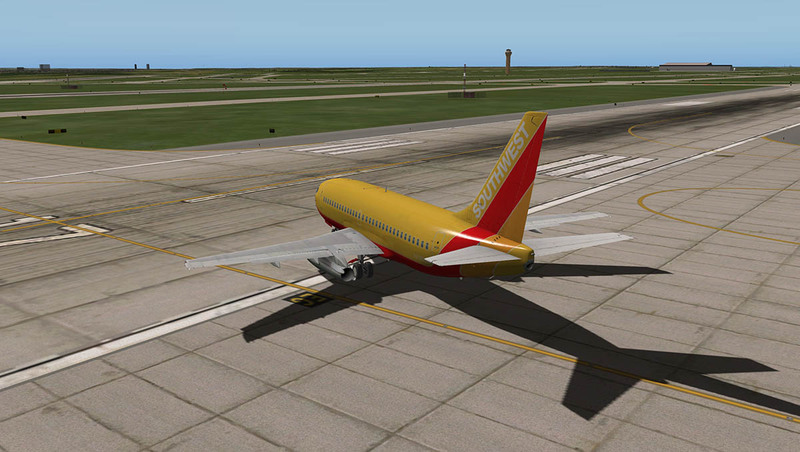 No truck outside but the aircraft will pushback when the brakes are off and you press the pushback tab. It moves a little to quickly for me, and turning is via the rudders. Brake to stop and disconnect the pushback. 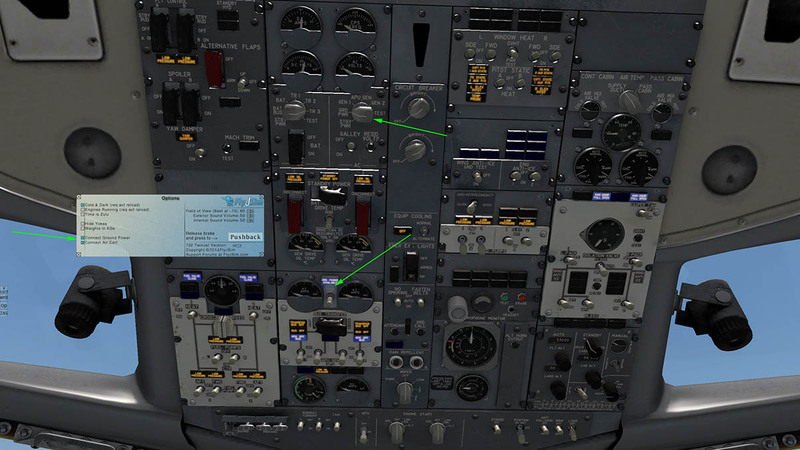 A final check of the takeoff vRef charts shows me my markers, note that vR (rotate) is vR (vRef) +15knts, the bugs will call out the vRef's as you pass them (you get the landing heights as well) which is very authentic. A last check of the gauges at the hold and when cleared the B732 is on the KDFW runway 17R. 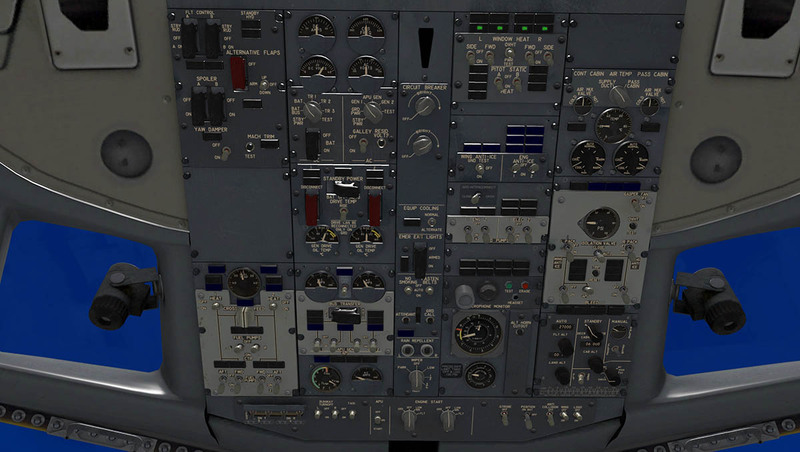 Power goes up but the JT8D's take a little while to build up the thrust, once there the push is long and quite powerful, the noise builds as well into that unmuffeted roar. 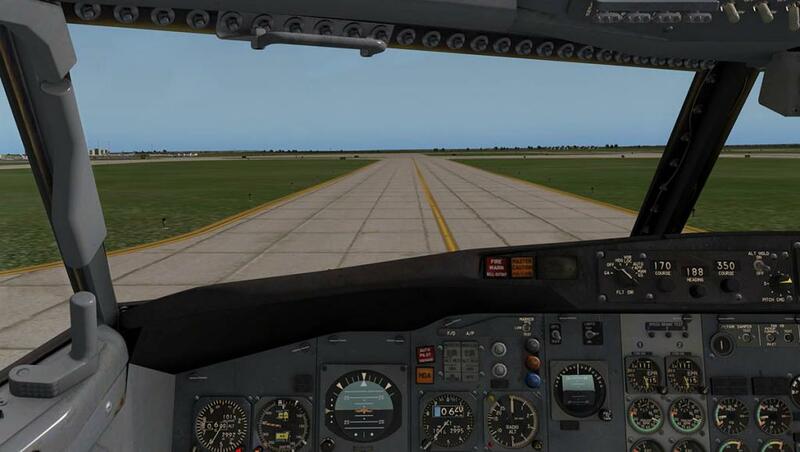 Vr and you only need a light pull back of the stick to get airborne, once clear of the runway and you are heading slightly to the right and you can feel the great central balance of the aircraft in the yoke, the aircraft is just under MTW, but the B732 feels very good and turns and climbs without much drama. Boeing pilots note it was always the best handling version of the B737 series, and here you can quickly feel why. In this era it was mostly VOR to VOR navigation, with a few NDB's thrown in for good measure. 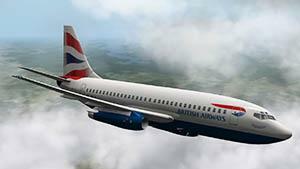 If you have the mentioned CIVA then you have a flightplan to fly to, If not then the navigation come down to you. 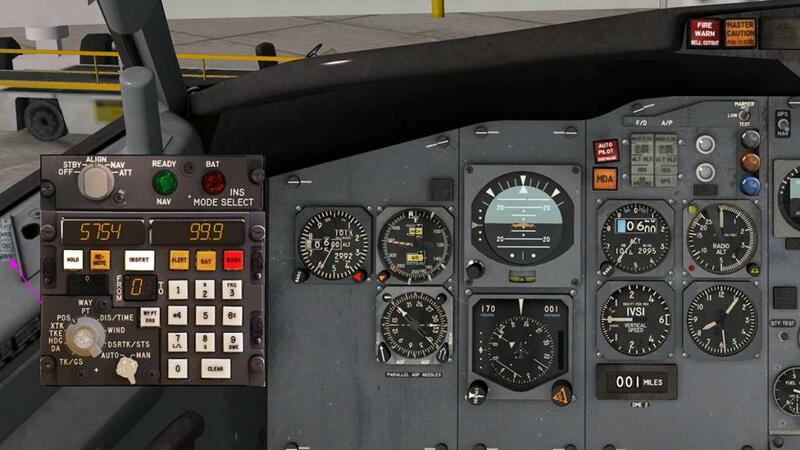 It is best to be well prepared with the correct headings and VOR/NDB frequencies at hand. 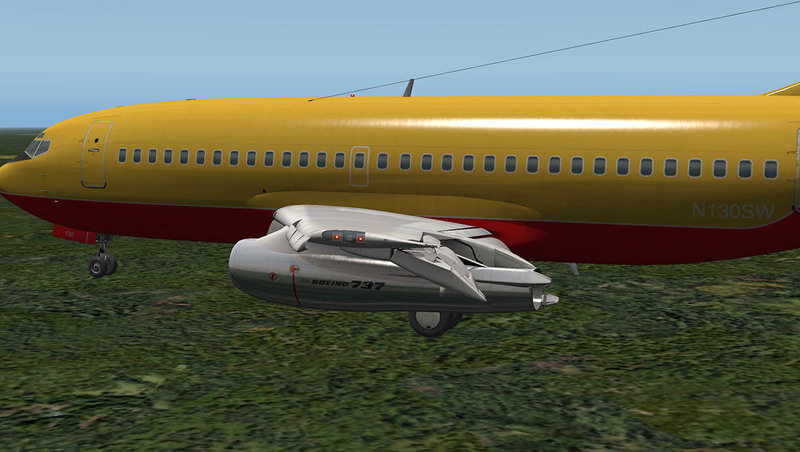 I found like with the B727 that the VOR's can be a little slow coming on line sometimes. NDB's seem to be slightly better for giving out the right direction. 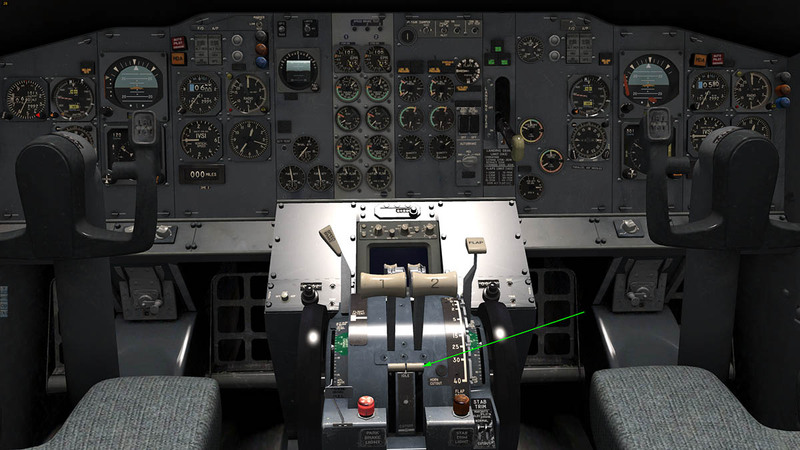 It helps here that the NDB knobs are in a great place just down to your right (pilot's side, left Co-Pilot) so I found I used them more in the B732. 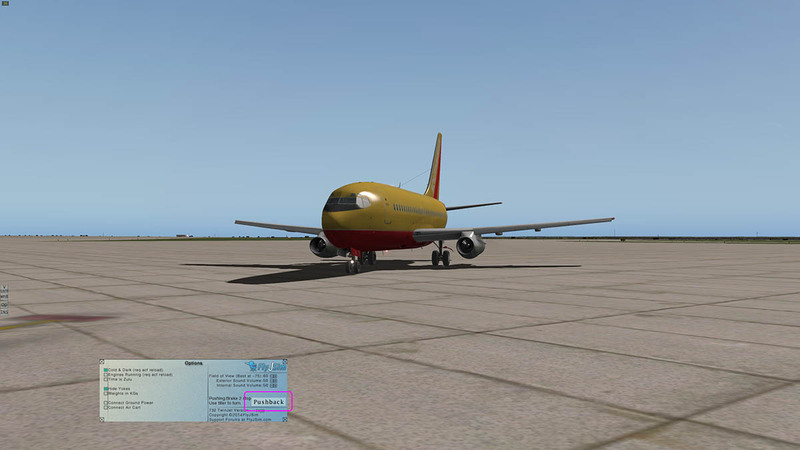 You want to fly the B732 by hand all the way to your destination as the B732 is so easy on you. 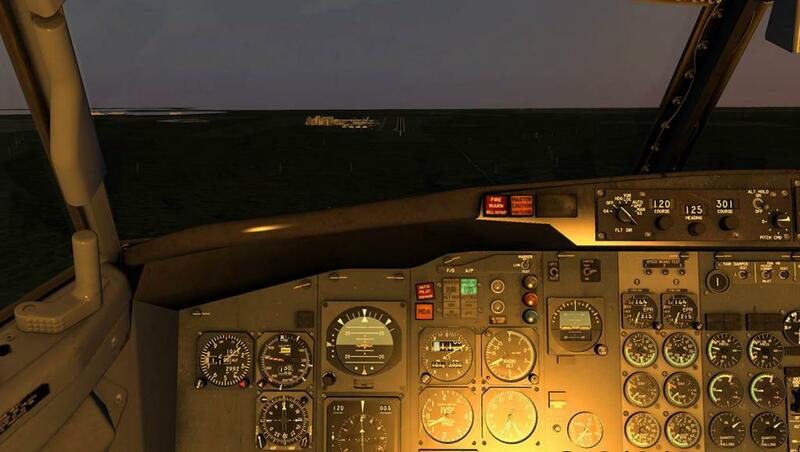 But the autopilot is very good as well, if not excellent. You do wonder if change does make system better. In this case the A/P is so simple but so powerful you wonder why they had to change it. The Sperry SP-77 (option version) is a brilliant bit of kit. As you are already pitching in your correct angle, you will notice the pitch knob is following you, engage the autopilot via the big switches and the aircraft just holds the pitch! Select the altitude you want (8500ft transition) and click on the ALT HOLD on the top of the A/P panel. 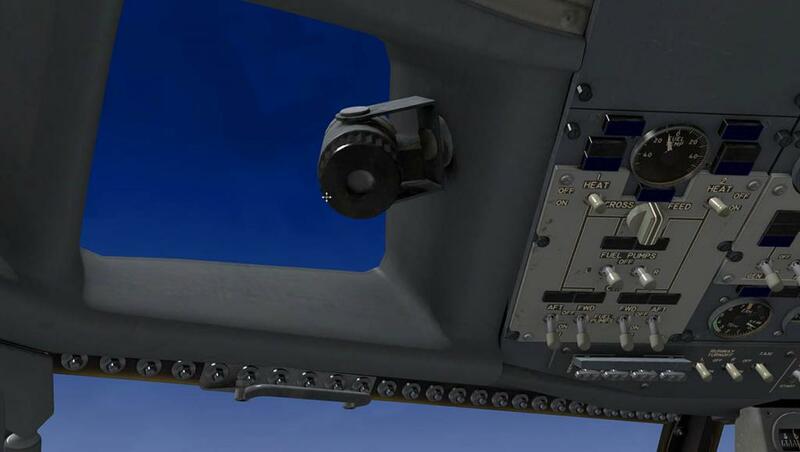 Make sure the IAS-OFF-ALT HOLD switch is in the off position (It should be already) and the aircraft will then climb and level out to the selected height. 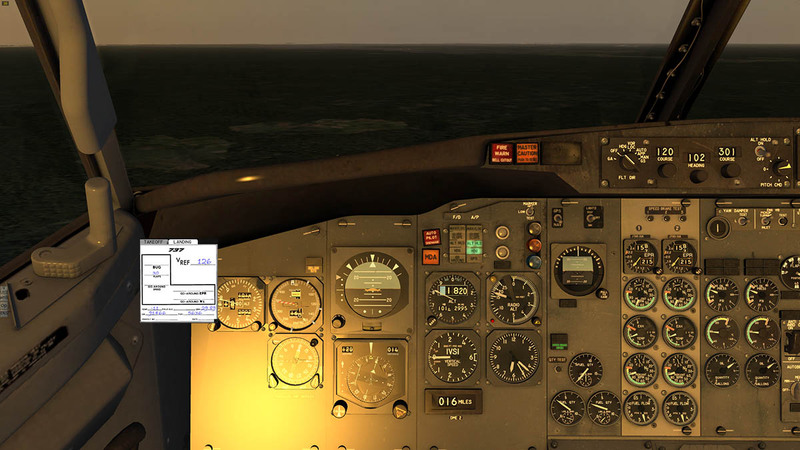 Want to hold any altitude then flick the switch to ALT HOLD. 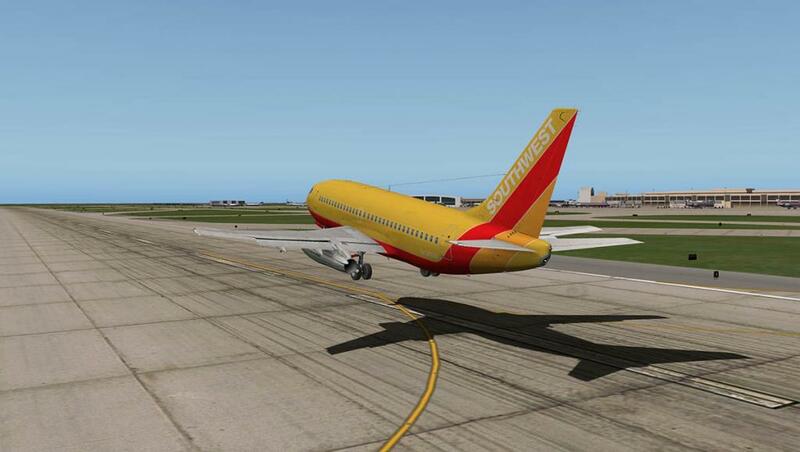 Note: that to change the pitch (climb or descend) you have to OFF the ALT HOLD first. 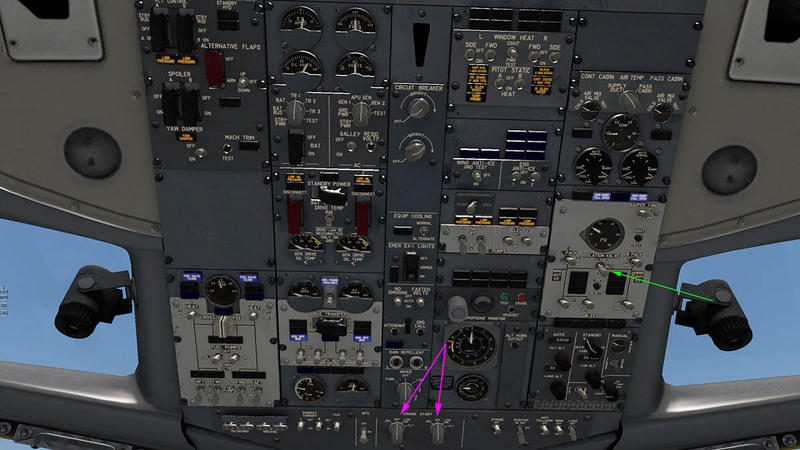 You have to click on a separate switch to activate the heading mode, and the Flight Director (FLT-DIR) switch as well, then the aircraft will turn to the heading bug. you can adjust the heading bug on the A/P panel and on the heading instrument as well for ease of use... In fact it is good to note that most adjustments have two sets of manipulators, arrows and curves and both work fine to what you like to use best. The VOR needle will note your direction and the distance is shown in the lower display. The aircraft will climb very easily but don't over stress the engines (they will burn out), keep everything well with in the green or with just a little yellow if required on the dials. As noted you don't need to stress the aircraft even while it is still quite heavy. 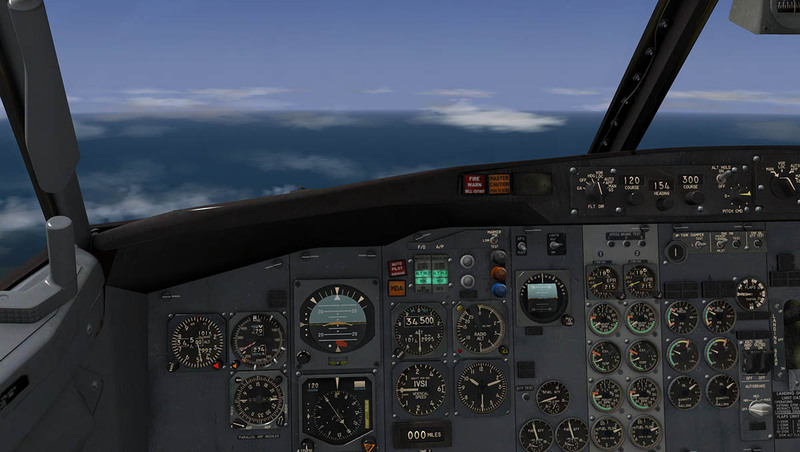 I am flying quite high at FL350 and only 500ft under the service ceiling, That will cost me a little in a fuel penalty, but still better than the stronger winds just below. At altitude the aircraft is nice and clean everywhere (OHP is nice and blank) and I only have to watch the navigation points. The route took me down the east coast of Mexico as far as Corpus Christi. 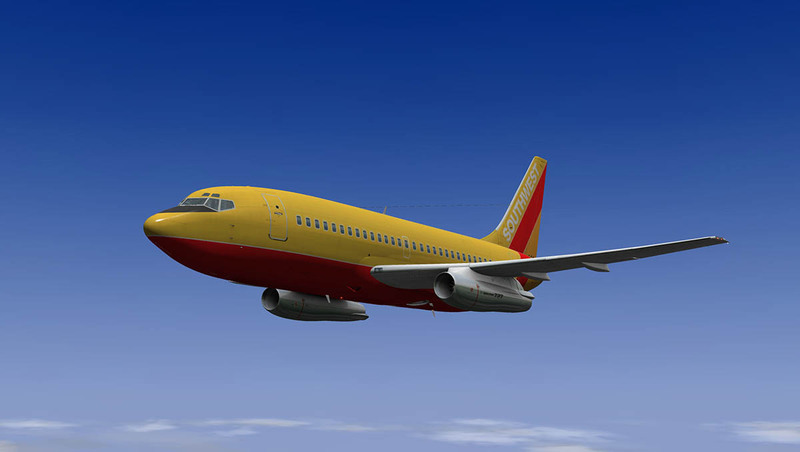 The Boeing 737-200 could not operate over water as there was no ETOPS (Extended range Twin Operations) allowed in the 60's and 70's in fact only one B732 was made certifiable. most 2-engined jets were restricted by the 60-minute rule. So I kept a visual sight to the coast all the way down before heading out to cross the coast at Campeche. You get seven liveries with the aircraft and unlike the B727 there will be no livery packs for the B732. A paintkit is coming. 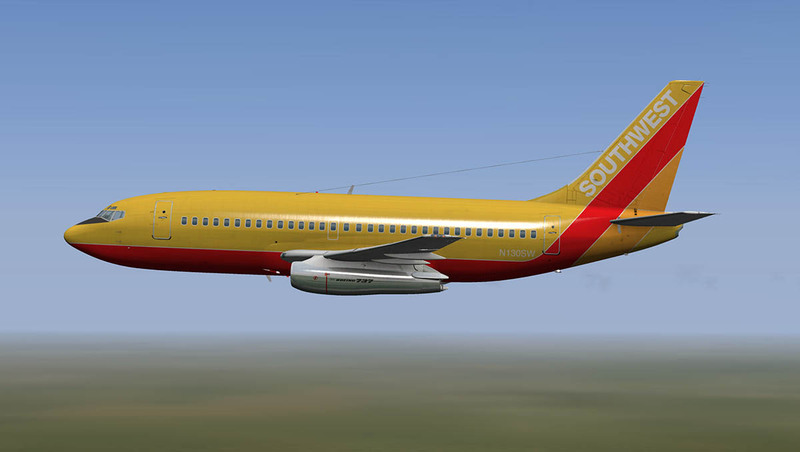 All liveries are excellent, but a few more American based liveries would have been nice... The Westjet is the best on the aircraft, the KLM is good as well. Also I checked and there was no hull fatigue cracks on the Aloha... so you are safe there. 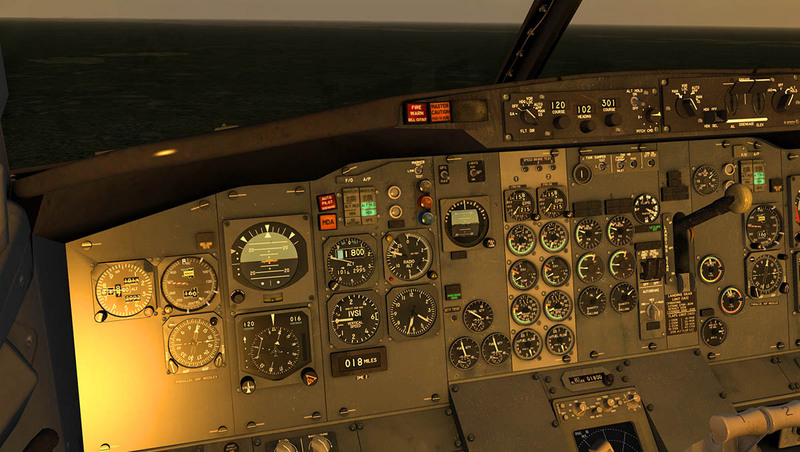 The cockpit lighting in HDR is gorgeous and yet you only have two adjusters in behind the dials and a flood up high. 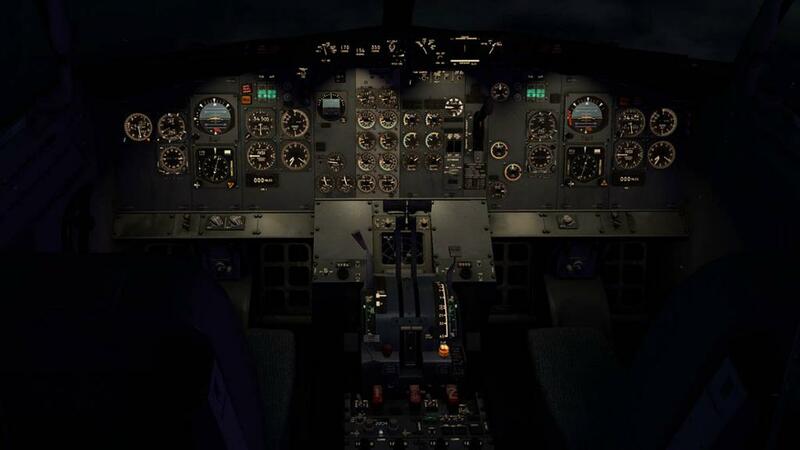 But you can find that perfect lighting setting and just the dials for landing in the dark. There are two fully adjustable spot lights overhead either side of the OHP. Turn on at night with the switches by the captain left side you can illuminate almost anything, the lighting detailing and reflection is amazingly good. 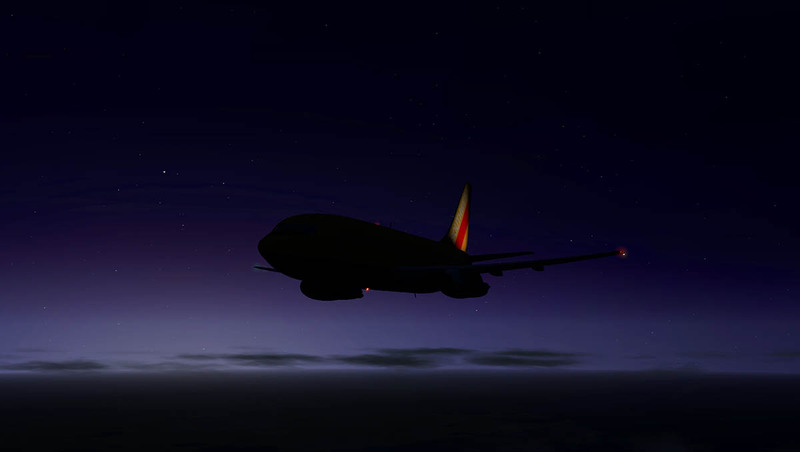 Beacon, navigation, tail (logo) and strobe lighting is very good, but the cabin windows are dark and not lit making the aircraft a black hole at night, FlyJSim says this will be fixed in the update. You have to watch your speed on the descent. 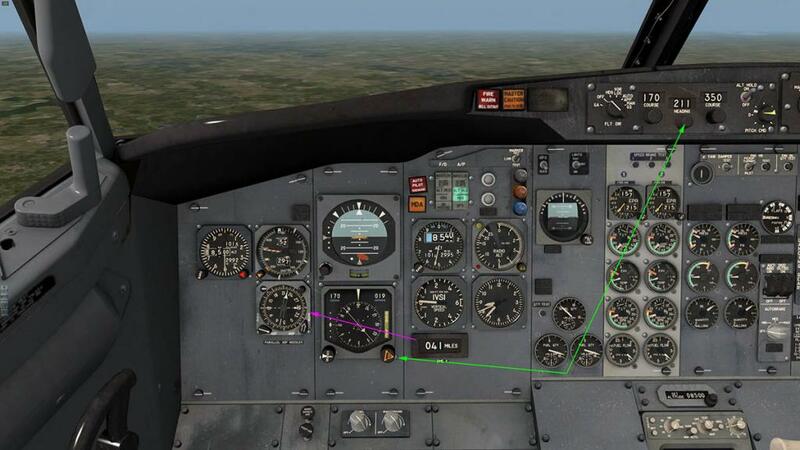 Pulling back the throttles means losing the power, but the aircraft will still gather speed as it descends. 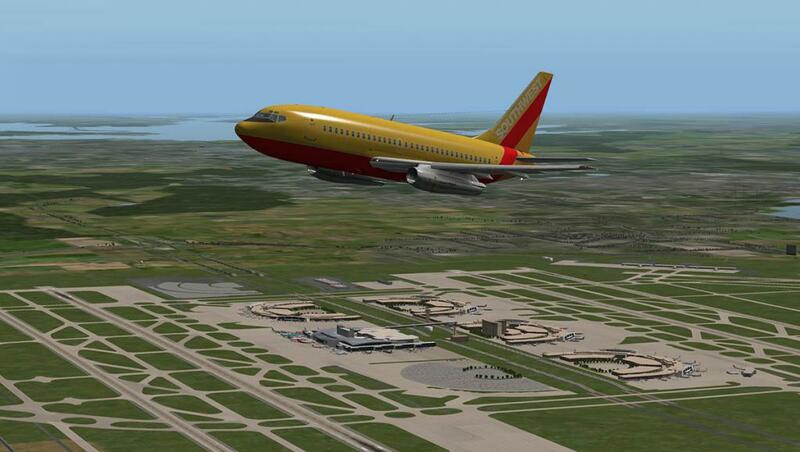 so allow for a period of space to get the speed corrected just under 200knts before your final approach. 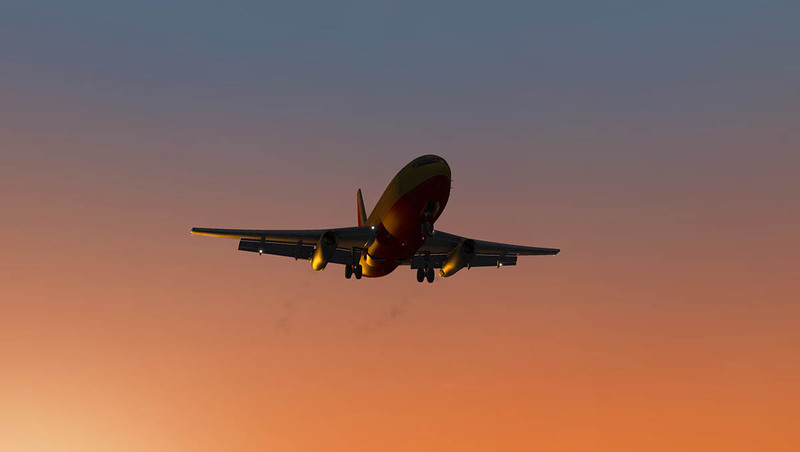 Yes you can use the speed-brakes but most pilot's pride themselves on not doing so, however sometimes you have no choice if you stay at the cruising altitude to long. 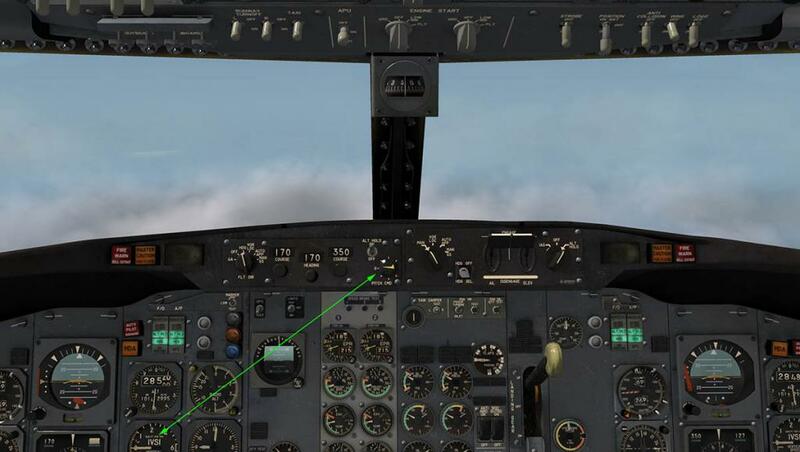 The speed can be controlled though but don't expect it to recover until the aircraft is absolutely level again, and then the speed falls off quickly. 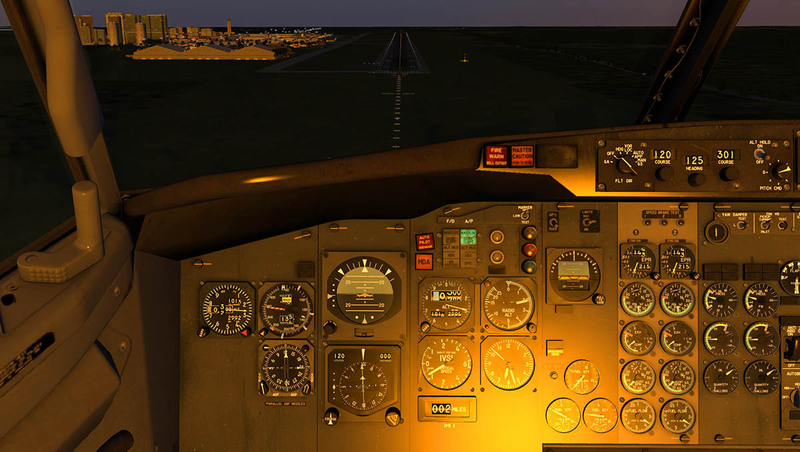 You will again find the handling of the aircraft to your wishes while manoeuvring the aircraft though the turn to the heading of the airport and switch the A/P back on to use the near perfect VOR alignment to the runway for Cancun MMUN's runway 12R. 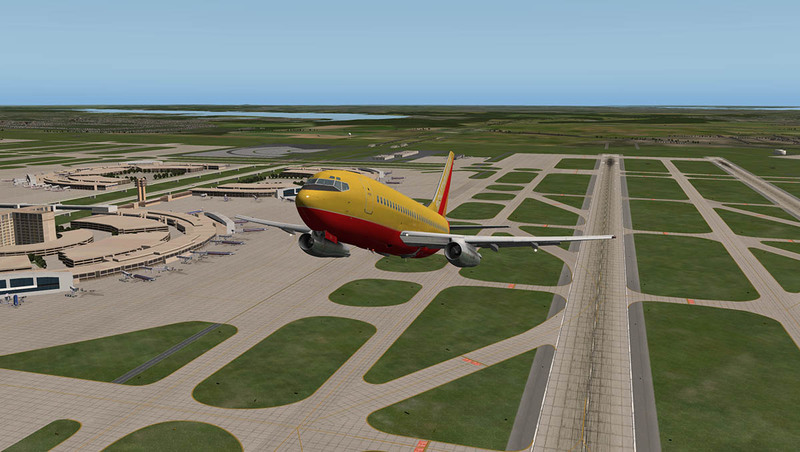 Be careful though as RWY12L is noted and displayed, but it does not exist in reality? 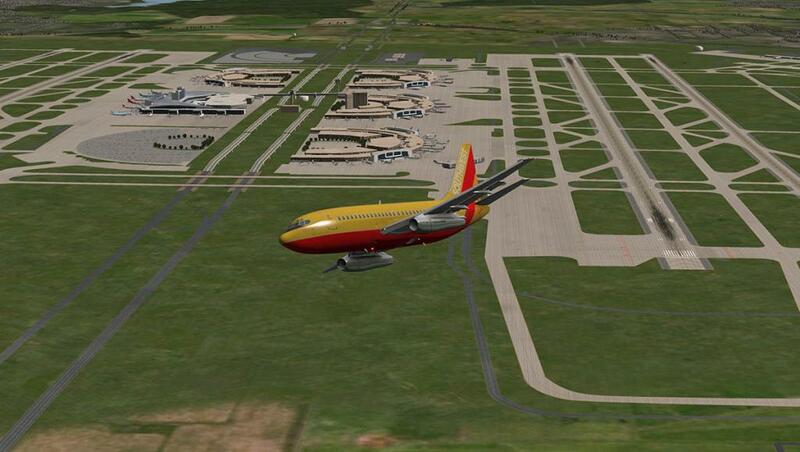 So don't select that one unless you want to land on the grass. Be careful of the speedbrake arm as it doesn't click into a position, only a green light on the panel shows you it is armed. 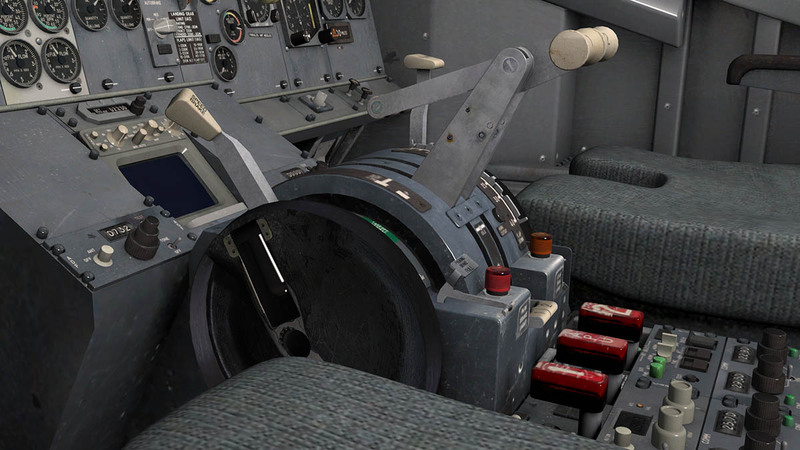 Autobrakes are set to MED. Coming in close to the airport I recheck my land vRef card at 30º flap I can use 126knts, which is very slow... As the flaps go down each notch you need to work the throttles to keep the aircraft from not going into the stall while still losing off the speed. I settled at 130knts going into the ILS system and the really slow approach allows you the one thing you never get in big jets... time. One thing noticeable was that it was also in the daylight back at Dallas are the strong light reflections from the panel. 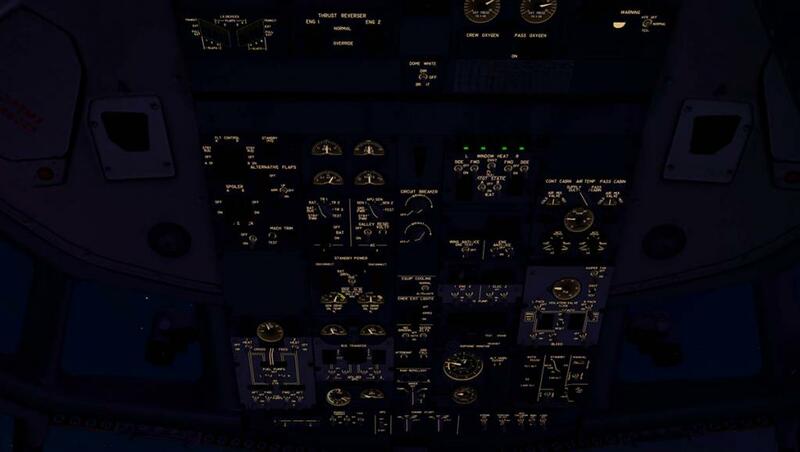 Here on approach with the setting sun behind me some parts of the panel were blanked out, it is authentic no doubt, but it makes you work just that a little bit harder. 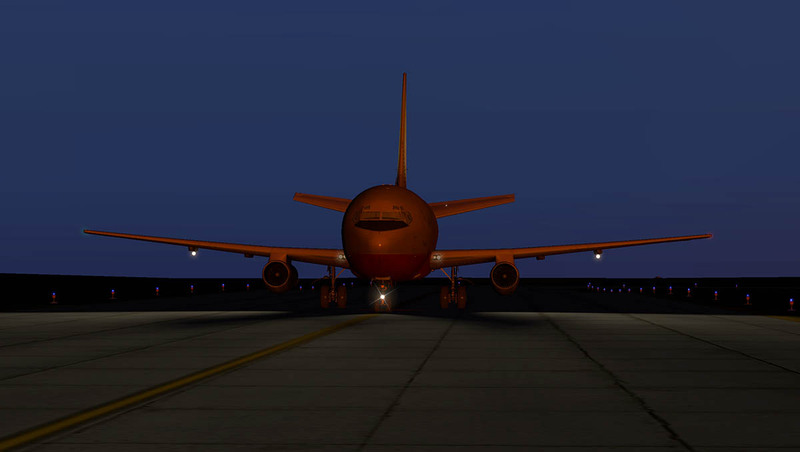 At 130knts your ride over the runway keys is very slow and the B732 giving you all the time in the world to position the aircraft down on the tarmac right where you want it. No autoland here either, so watch that float. Those wonderful clamshell engine reverser doors bang into place and start the pushing out thrust to slow your speed, but they are not nowhere near as powerful as today's powerful reversers, so don't rely totally on them to slow you down. 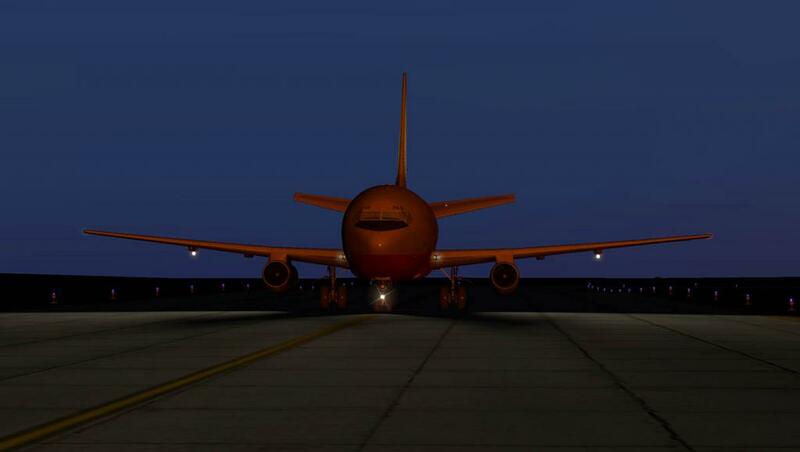 Power off and you are in the pace taxi mode and clean up the aircraft ready for the exit to the taxiway. 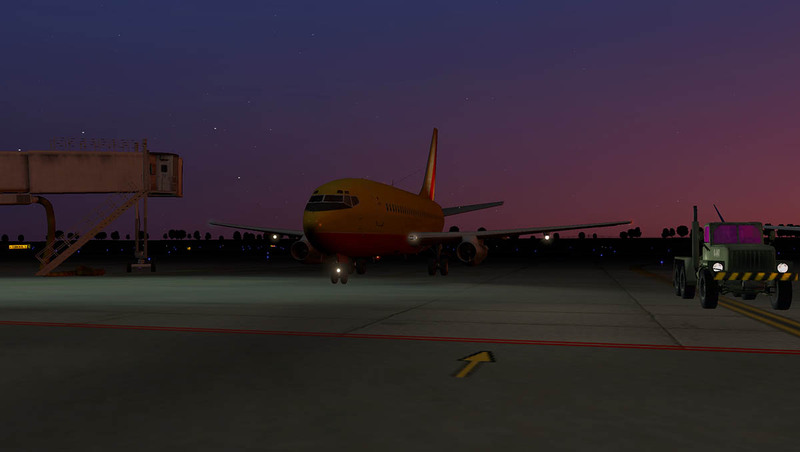 X-Plane's HDR lighting is great on the ground. Strobes, strobe brightly and red and green nav lights illuminate the runway, you have four landing lights that can all be turn on with a flick of a small panel behind all the switches. 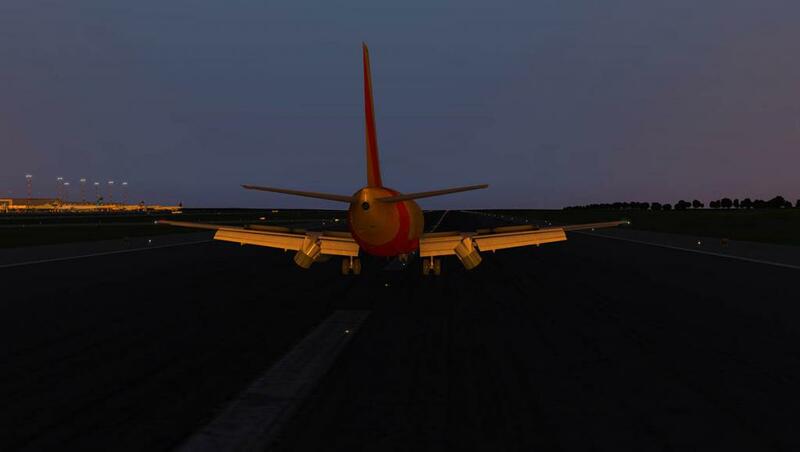 there are also taxiway turning lights and a turning front wheel position taxi light. 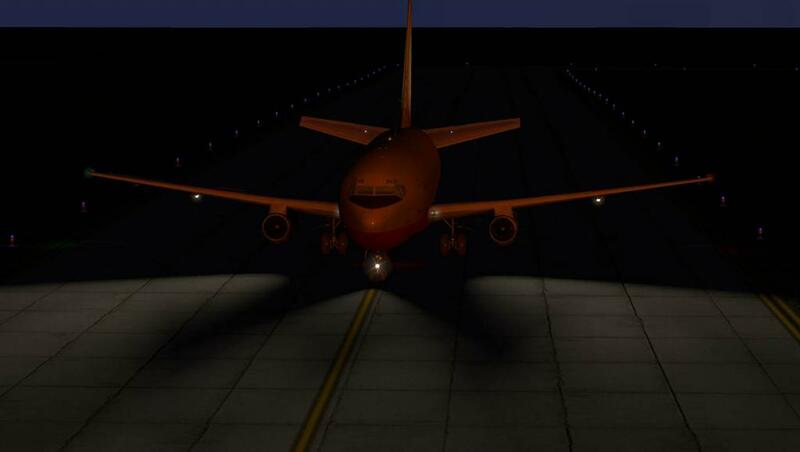 All lights illuminate the areas around the aircraft to making taxiing at night one of the best and easiest yet. 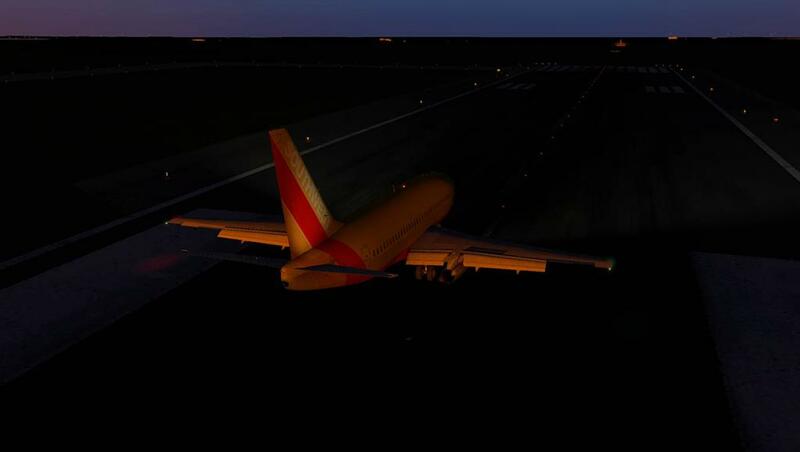 (hard to do in X-Plane) only the RWY turn taxi-lighting is a little dim at the source, the actual lighting is however fine. A taxi to the bay and the flight distance was 1114nm, Fuel was getting low as well with that high altitude at just over 5000lbs left. But a shutdown and connection to EXT Power and the aircraft was ready for the morning return to KDFW. 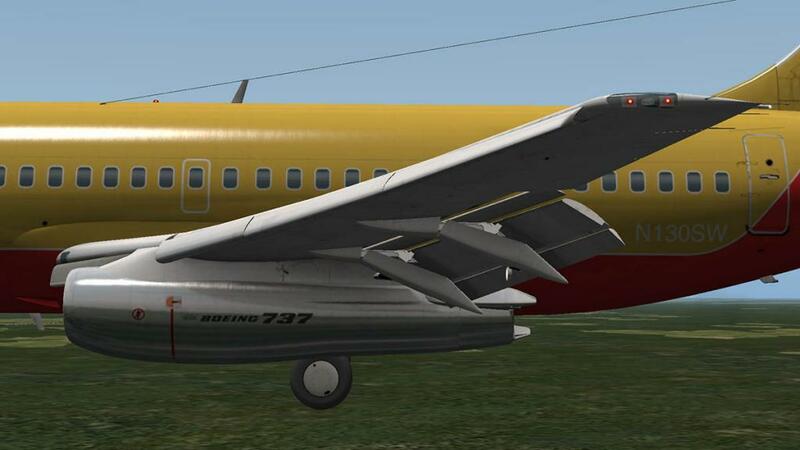 The Boeing 732 will be certainly compared to the FlyJSim Boeing 727 Series. 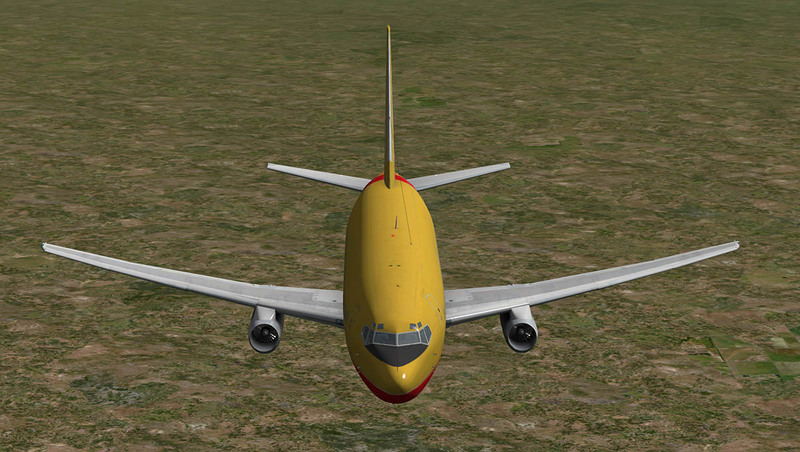 If you liked the B727 then you will certainly want the B732 and you won't be disappointed. In quality and detail they are exactly the same. The B727 was a bit of a drama queen, but then that is what you really loved about the aircraft. 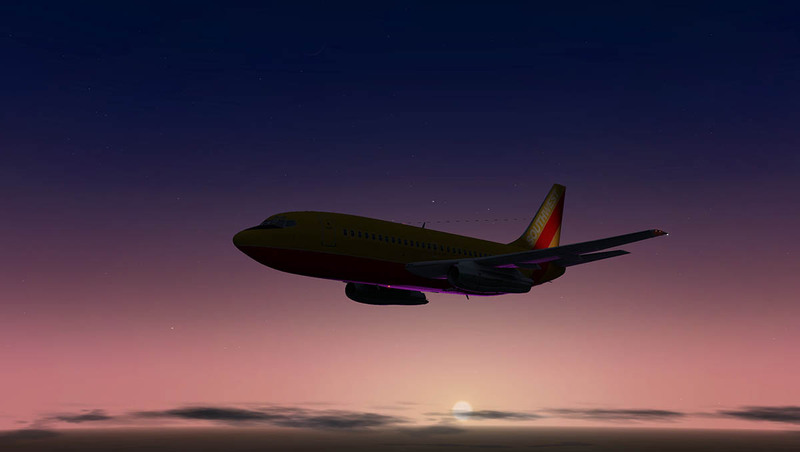 The B732 is a more neutral flying aircraft and is really more composed in balance compared to its bigger sibling. 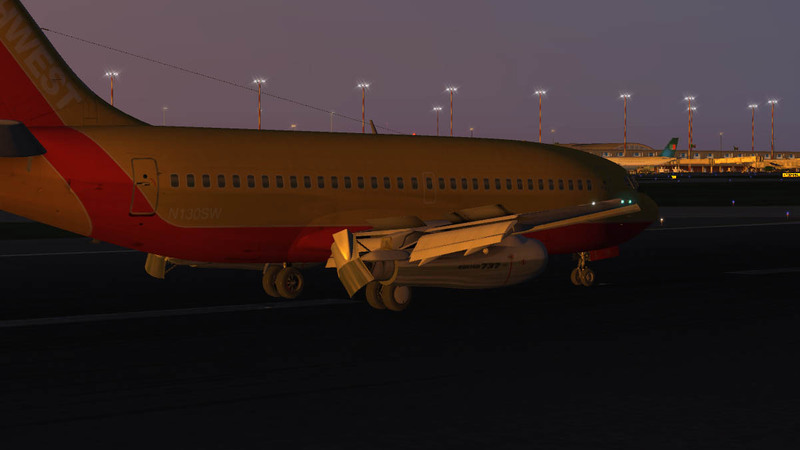 The B732 feels smaller than the B727 and in that context you may feel your not getting as much aircraft even though you are paying less (there was three variants as well for the B727 with the full series). But that will be missing the point. there is really not much to slip between both aircraft, They would really depend on your mood in that if you want to wrestle an aircraft (B727) or if you would just want a good no-nonsense aircraft (B732) that is very nice to fly over a continental distance, and both have a time and a place and both aircraft hark back to an era in that when aircraft were in a period of a glorious adventure and breaking aviation records. 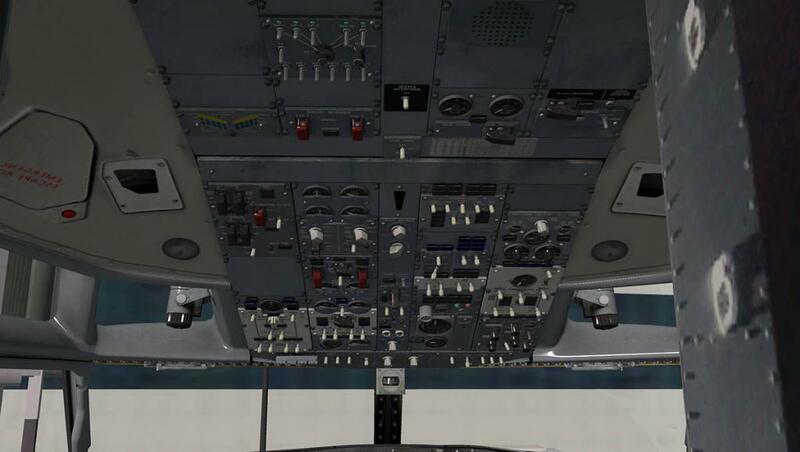 If you have flown the B727 then you will easily slip into the left or right seat of the B732 and feel right at home. 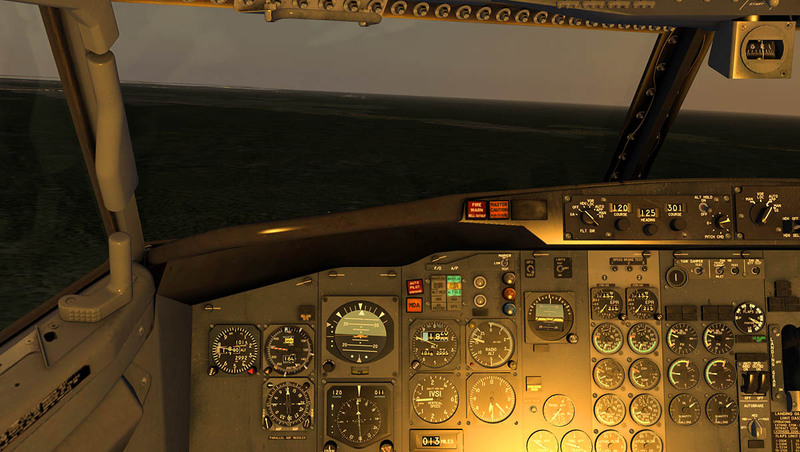 If you are new to these FlyJSim 60's era aircraft, then yes there is a bit of a system's and operation's learning curve, but the results are well worth the effort. 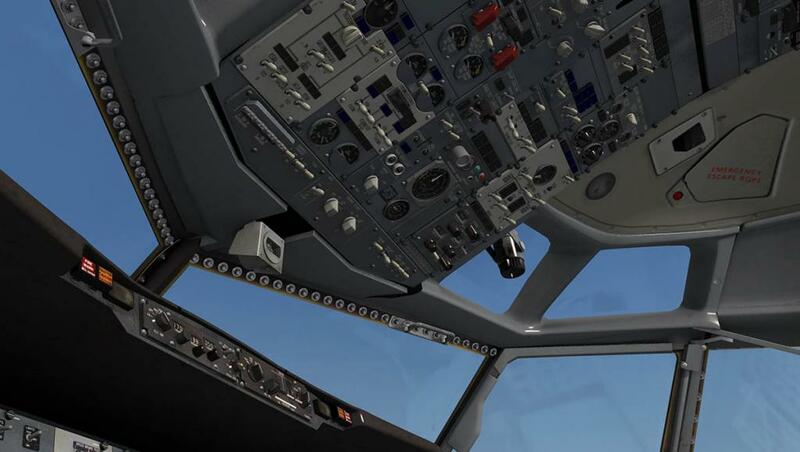 All aircraft systems including: Air systems - Anti-Ice - Autopilot(SP77) - Com/Nav radios - Electrical - Fire protection - Hydraulics - Fuel - Weather radar - Warning systems and cockpit call outs are fully active. There are a few more benefits with the B732, the Sperry Autopilot is a gem to use and not hidden away behind the throttles (B727) but right there where it should be on the glareshield. 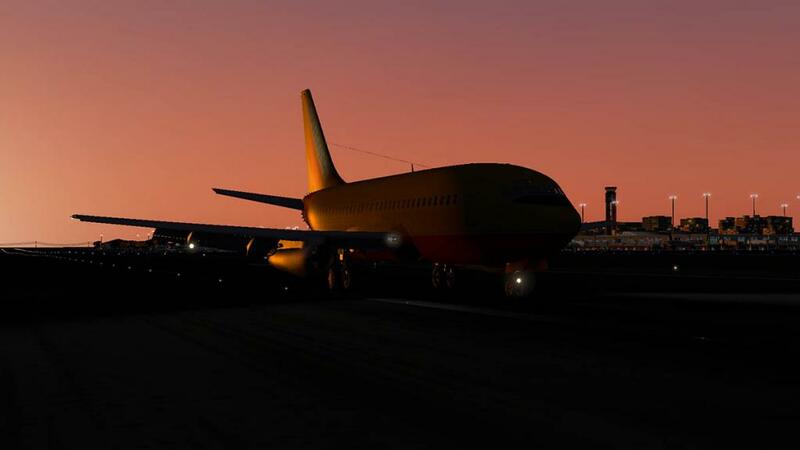 The lighting (except for no cabin lighting?) is excellent and the whole aircraft is so well put together in every area. 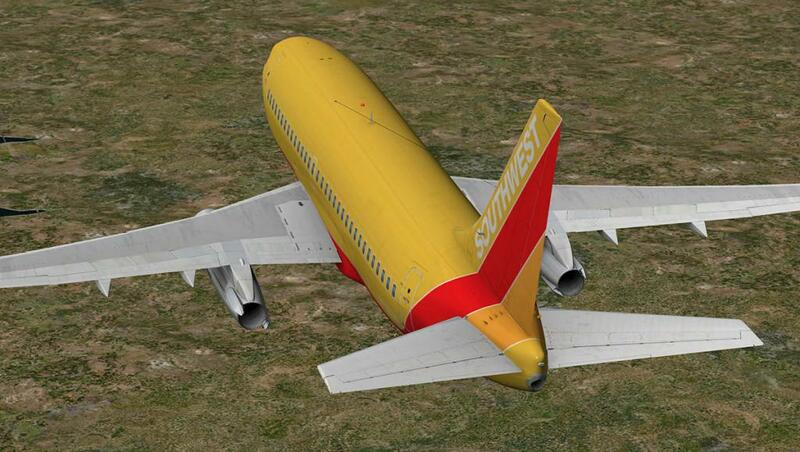 You don't get a lot of extra features with FlyJSim aircraft, but you do get quality and great flying machines. 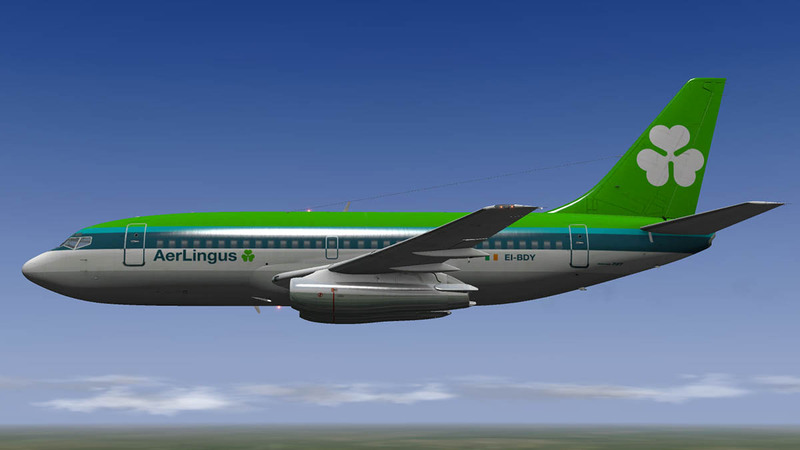 And the Boeing is certainly a great if not a sensational aircraft to fly and great overall value. 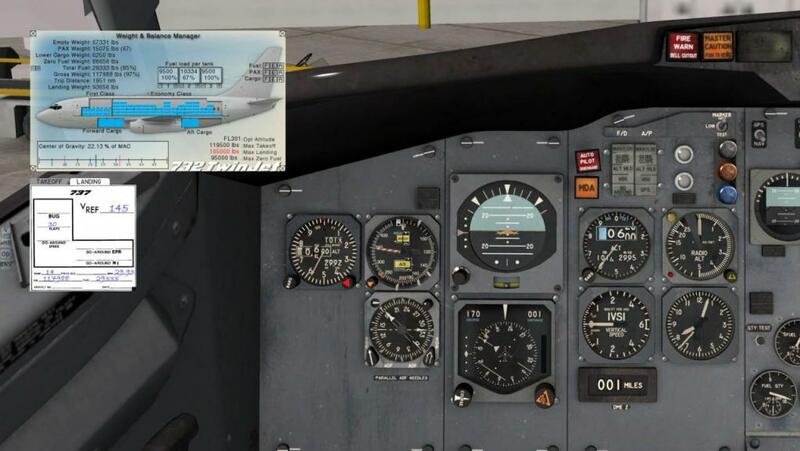 Small note : in that the actual review was conducted in X-Plane version 10.25, I also flew the aircraft in the b10.30b1 to check for any differences (there was none and the frame-rate was excellent in both versions) a few of the images however were taken in b10.30b1 to check out the clouds... In frame-rate it is worth noting that if you switch off the "draw per pixel lighting" which highlights textures you will gain 30frames!. The aircraft will look slightly plainer outside, but 30frames is still 30frames... And yes I know that Southwest Airlines fly from Dallas Love Field and not KDFW, but there is sadly no KDAL scenery in X-Plane? Good review...made me sucking for this babe so much that I bought It! 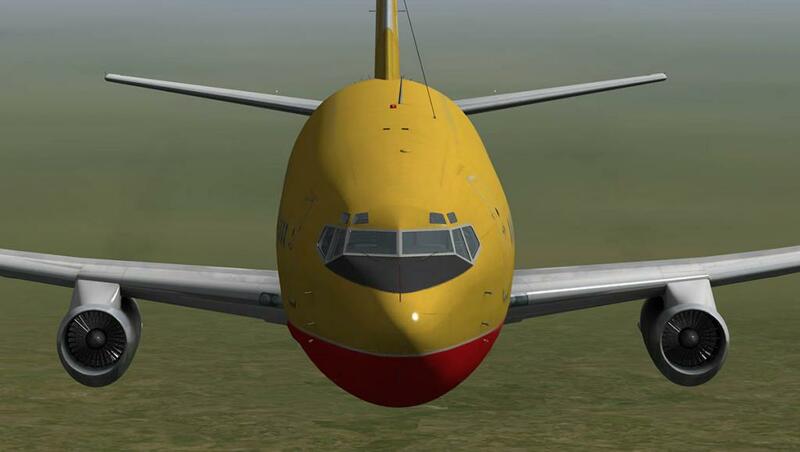 Yes it is a great aircraft. I miss the Love! Has anyone tried placing XPFR pilots in this product as I prefer visually finished outside views? This is not a debate about the pro or cons of pilots for esthetic reasons; it’s just a preference I like regarding the finishing of a product. Or another option is for aircraft designers/developers, they could implement an option for pilots or no pilots. 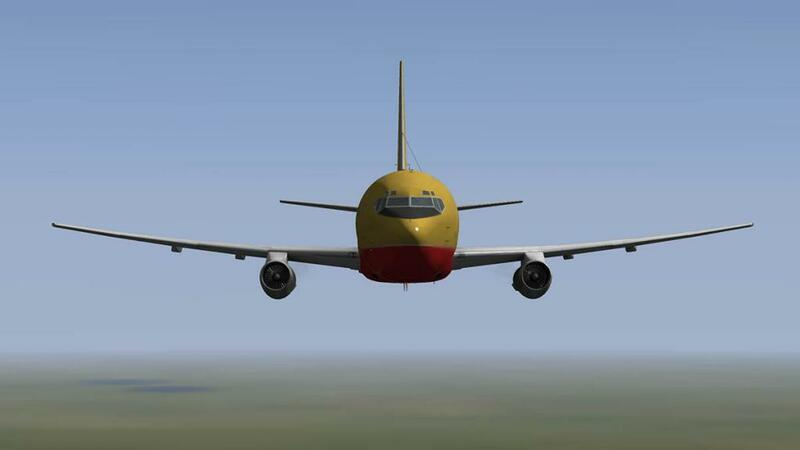 JRollon has already done this in his CRJ200 and his BAE Jetstream 32. 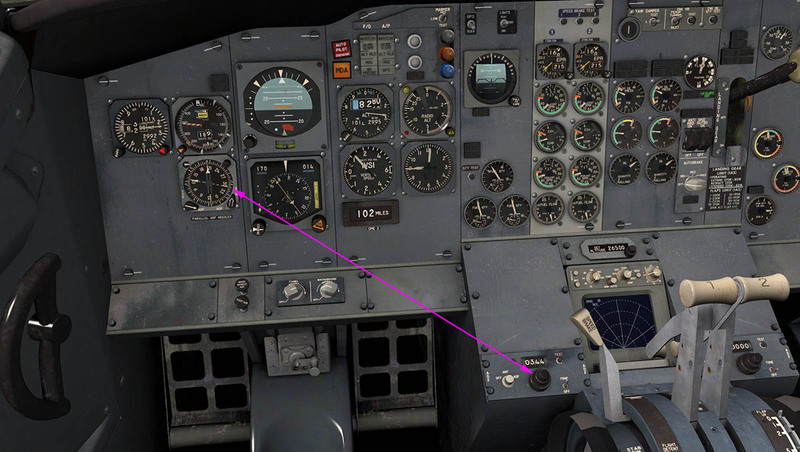 On both aircraft (I think I remember rightly) you have the option to add or remove the copilot, all you have to do is click on him in the CRJ200 and there is an option in the BAE Jetsream within the menu on the control yoke. If the xp community speak loud enough to the developers I am sure they would listen and implement it into their aircrafts. 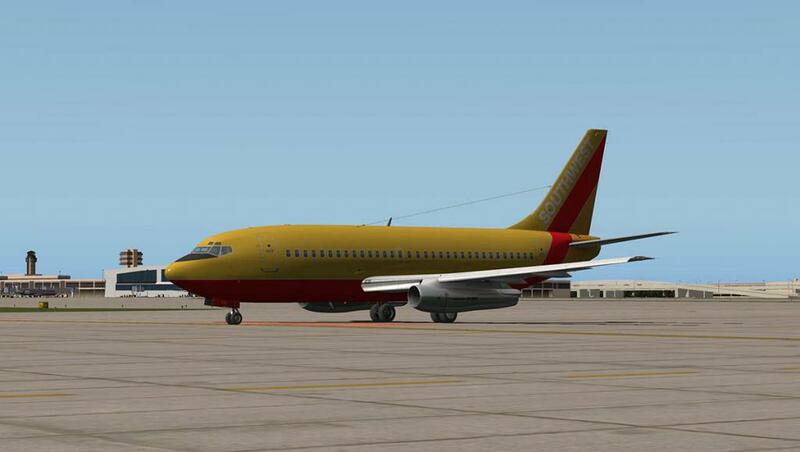 FlyJSim may add this is the next update? 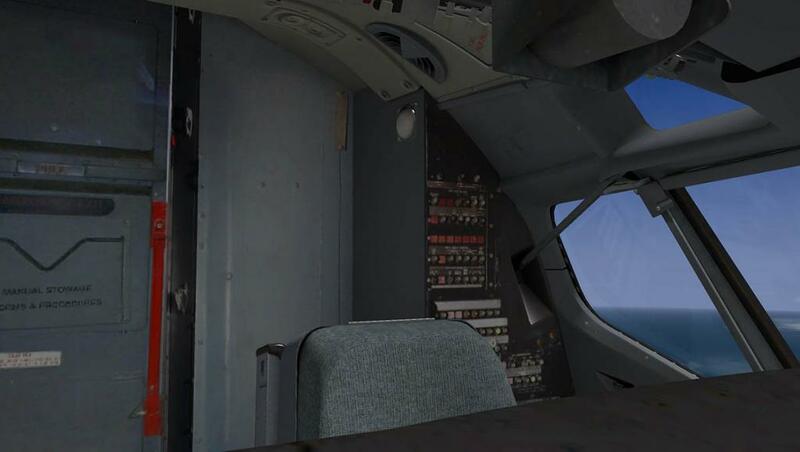 If FlyJSim adds it I will buy NOW, the same goes for his other products. His products look fantastic and I would buy them all if they had a pilot options in place. I am out of the Carenado stable. 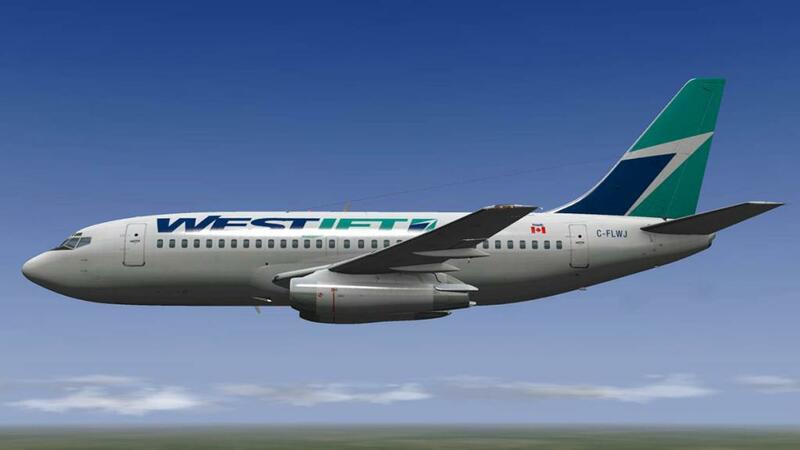 Looks like an amazing aircraft, so different compared to the newer 737-800s! 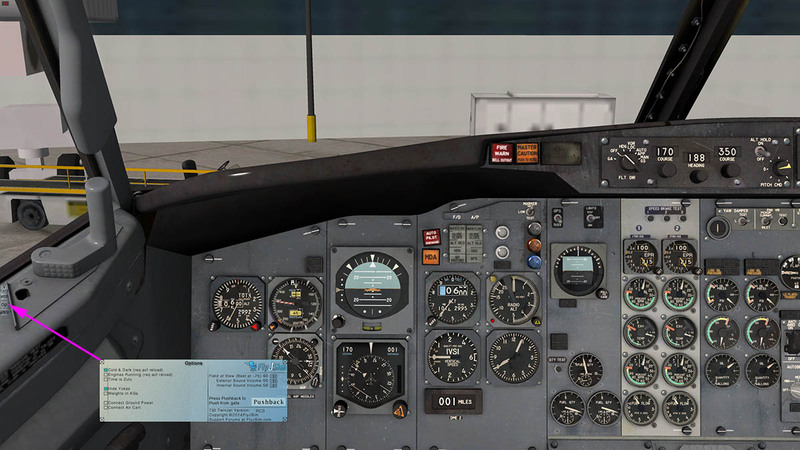 I was looking at this, but then found FJS Dash 8. The only thing that stopped me was the price... might be starting to regret that decision now. 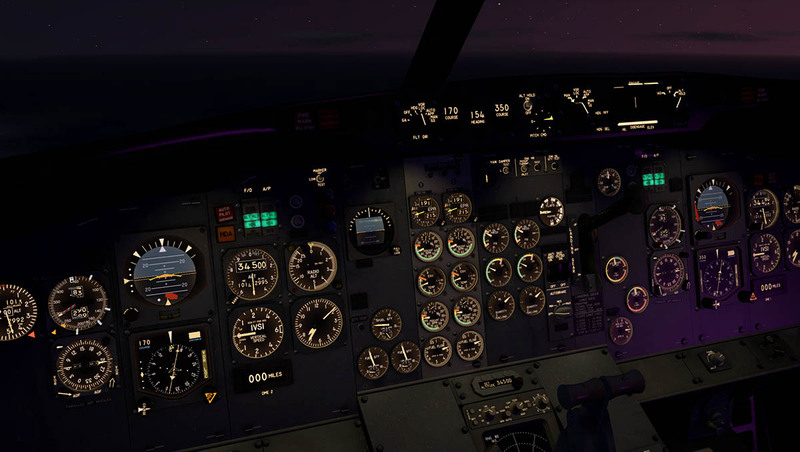 I was scared to buy the 732 because of the price, I had no idea what to expect since I don't buy many add-ons, so I pictured it as a risk. If I had found this review earlier, I almost certainly would have had the confidence to chose the 732 instead of the dash. But never the less, I'm still over the moon with the Dash, a very subtle introduction into the world of payware. I'll be interested to see what you guys think of it too!